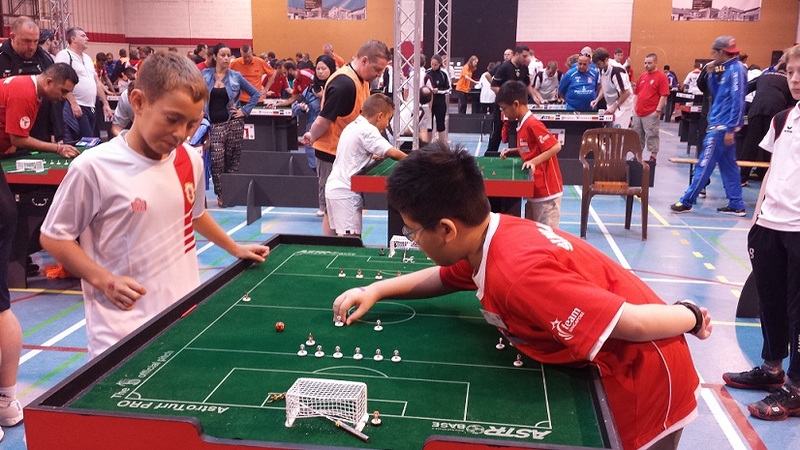 As we begin the 2015 season, we look back at the adventures and expoits of Team Singapore in the FISTF Subbuteo World Cup 2014 held in Rochefort, Belgium. 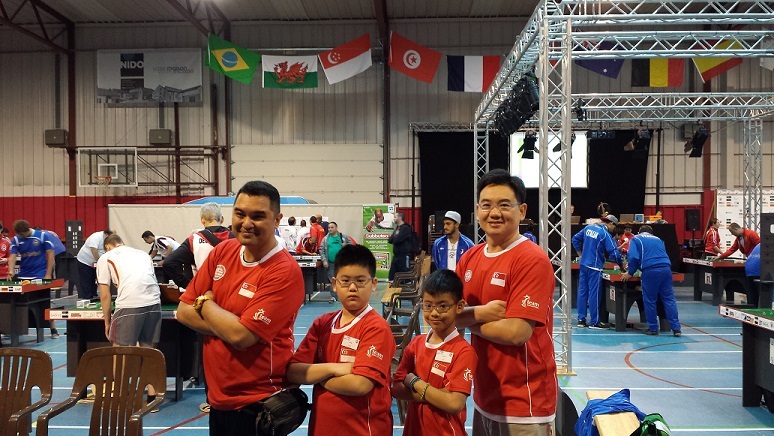 Team Singapore was proudly represented by Rudy Hesty Roselan, Bernard Lim, Luke Lim and Isaac Lim. 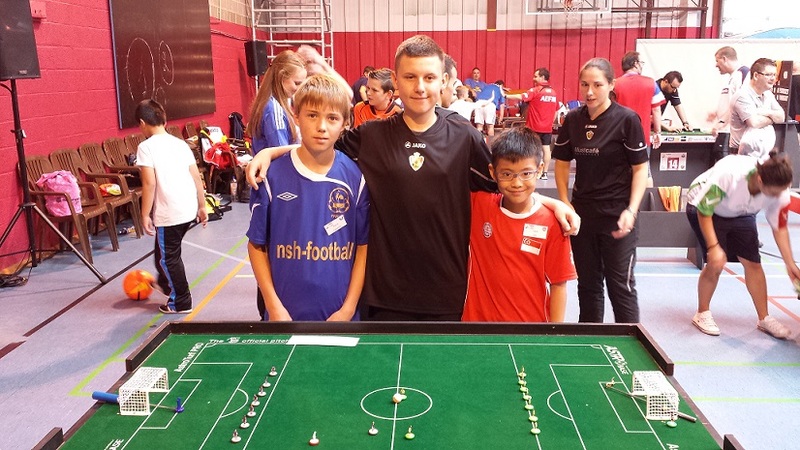 Rudy and Bernard competed in the Open Individual event; while Luke and Isaac competed in the U12 Individual event. The 4 of them then competed in the Open Team event on the 2nd day of the tournament. 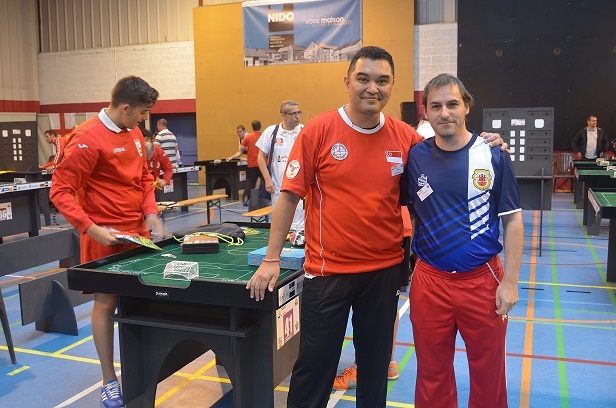 Rudy was drawn into Group 2 of the Open Individual Competition against the likes of Saverio Bari (Italy), Lawrence Alvarez (Gibraltar) and Nuno Henriques (Portugal). Rudy got his World Cup campaign off to a great start by beating Lawrence Alvarez 3-1 to score his first World Cup goals and notch his first World Cup game win. This victory go some way to ‘avenge’ the defeat that compatriot John Ho suffered at the hands of the same opponent back in the 2012 Manchester World Cup. 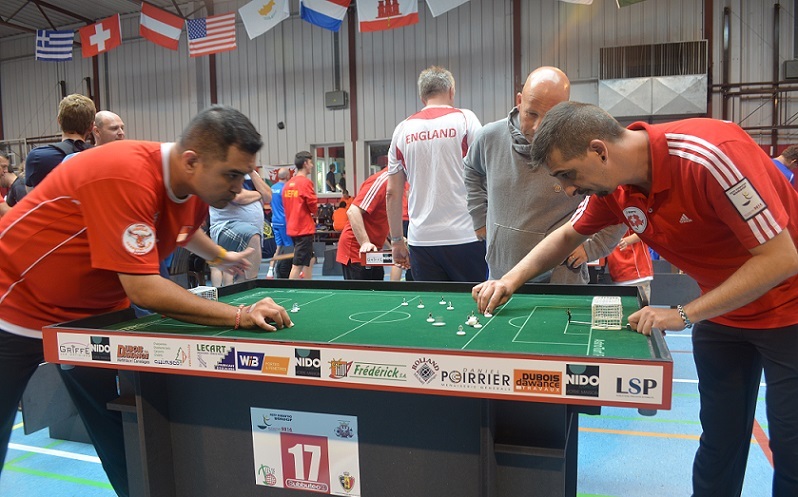 In his second game, Rudy continued his fine form and built on the momentum garnered from his first game to narrowly defeat Nuno Henriques by a solitary 1-0 to take his second World Cup game win. With 6 points from 2 games, Rudy had qualified to the next round!! 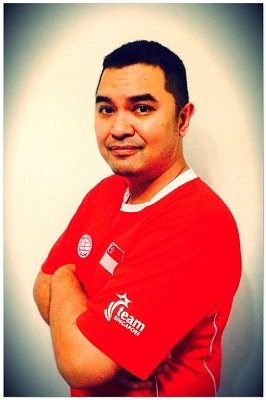 He had created HISTORY – being the first Singapore player to have made it out of the Group stage and qualified into the Knock-Out stage in a FISTF World Cup!!! … Bravo Rudy!! Congratulations!! 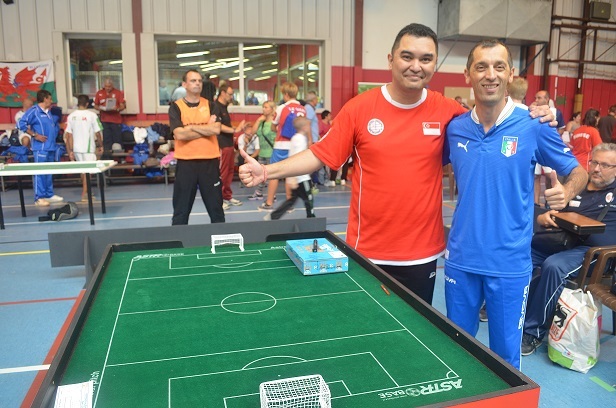 Having already qualified, Rudy took to the third game against Saverio Bari – the seeded player in the Group – in a super-relaxed mindset and mood. He was duly beaten 0-6 but no matter … as all the hard work has already been done as he prepared himself for the Last 32 knock-out round. In the Last 32 knock-out round, Rudy was pitted against Luca Colangelo (Italy). Against the far more superior Italian, who went on to become 1 of the Semi-Finalists of this World Cup, Rudy put up a spirited display only to lose 0-8. While his World Cup campaign had come to and end, Rudy had certainly made a name for himself and definitely brought glory to Singapore!! 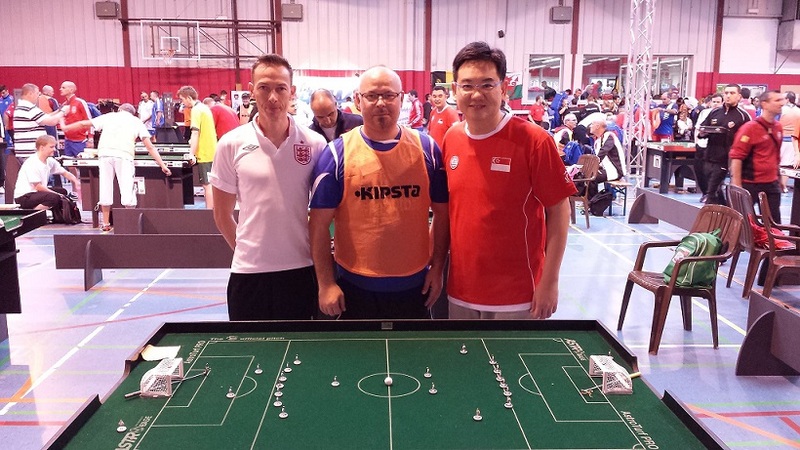 Singapore’s other player in the Open Individual Competition, Bernard Lim, was drawn into Group 11 against the likes of Chris Thomas (England), Angelo Borg (Malta) and Renato Kort Kamp (Brazil). 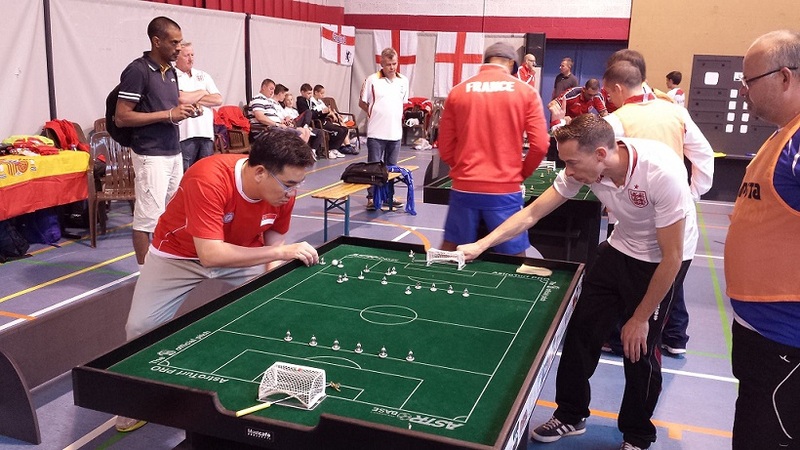 Bernard’s maiden World Cup game was against the seeded player in the Group – Chris Thomas the England captain. Though Bernard displayed some deft touches and flicks to earn some praise from his opponent, the class and guile of Chris Thomas prevailed as Bernard lost the game 0-7. 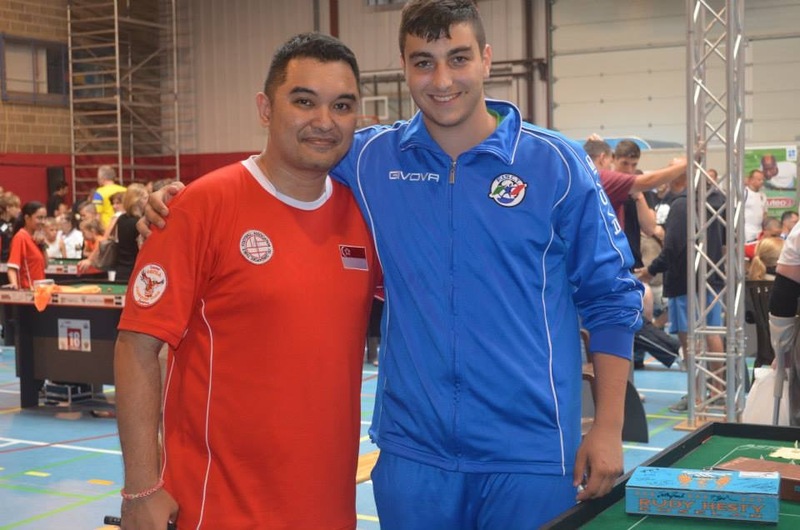 Bernard’s next game was against Angelo Borg, a former top ranked U19 player who was playing in his first Open event as he was no longer eligible for the U19 event. Again, the class and skills of the Maltese youth was far far more superior as he went on a rampage to build up a superior goal difference. Bernard, unfortunately, was at the wrong end of a 0-11 thrashing which effectively ended his World Cup campaign after 2 games. It was indeed a ‘rude awakening’ for Bernard. With his morale and spirits super-low from the manner in which he was knocked-out, Bernard approached his third game with a strong sense of redemption. He was determined to take some positives out of his maiden World Cup campaign and to restore some pride in representing Singapore after the 2 disappointing displays which he felt he had let down the nation. Against Renato Kort Kamp, Bernard regained his composure and restored some pride and confidence by putting 5 goals past his opponent to win 5-0; in the process scoring his first World Cup goals and securing his first World Cup game victory!! 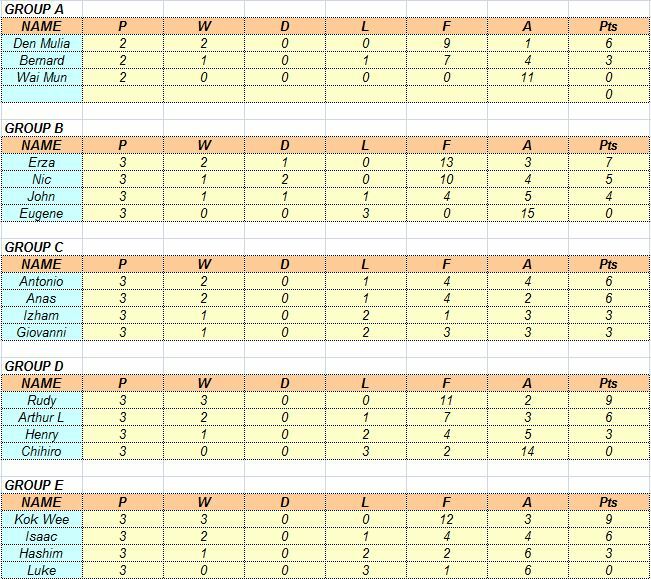 In the U12 Individual Competition, our 2 Singapore junior players – Luke Lim and Isaac Lim were drawn into Group 5 and Group 6 respectively. 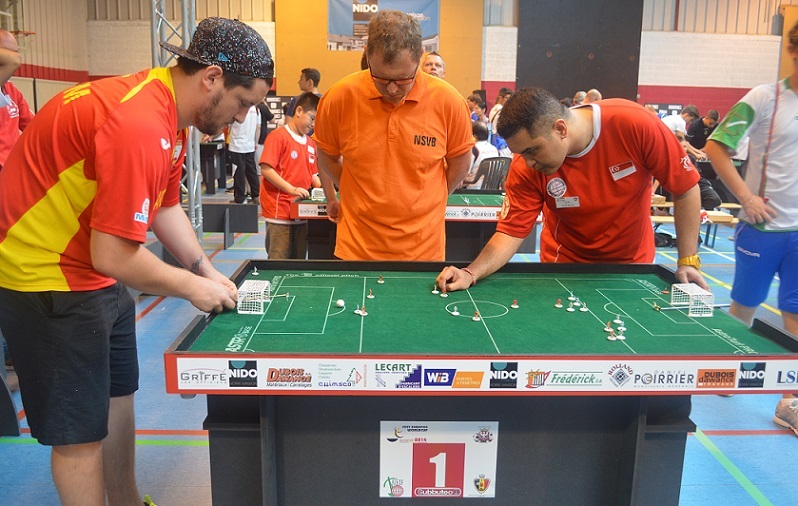 Luke was up against Alwin Krause (Germany), Corentin Boltz (Belgium) and Jakob Gerstl (Austria); while Isaac was up against Tommaso Lazzari (Italy), Pierre Laquerbe (France) and Vasco Henriques (Portugal). 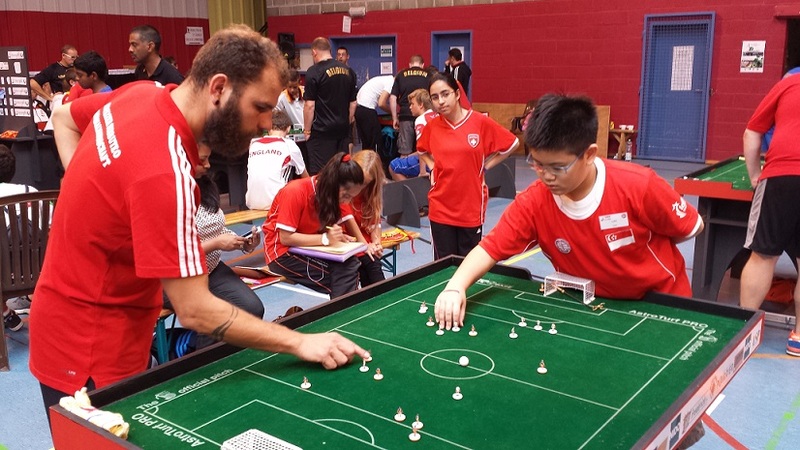 It was a real eye-opener for Luke and Isaac to see the difference in equipment and concentration levels of European youths – while alot of our Singapore youngsters are still on beginner type bases, their European counterparts were already using professional bases. Their accuracy and skill level was another area of the game worth learning from. 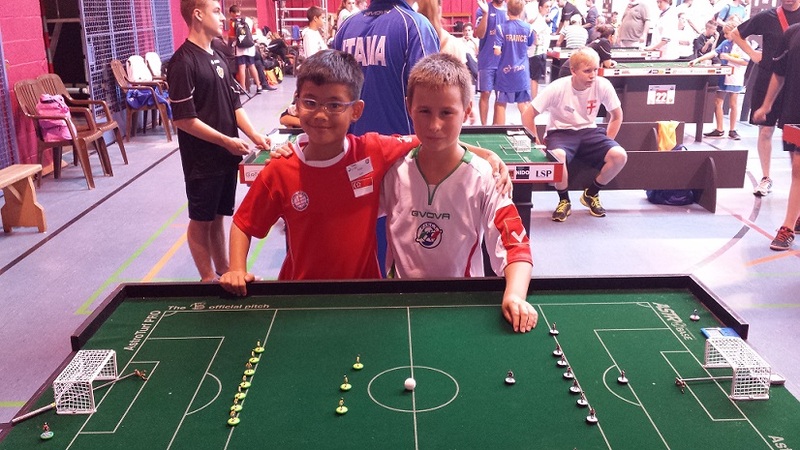 Luke opened his maiden World Cup campaign against Jakob Gerstl and lost 0-3. 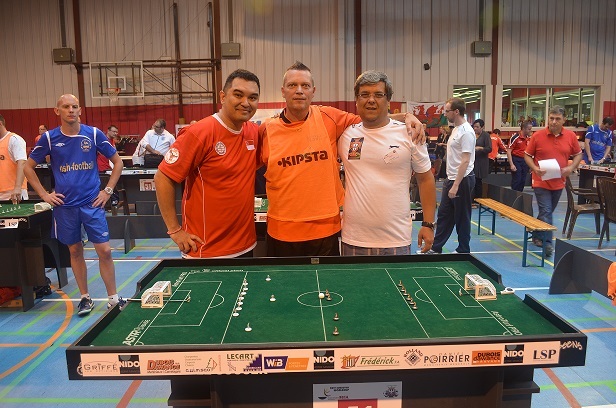 His second game was against Alwin Krause, who eventually won the Group with 3 wins out of 3 games. Against the seeded player in the Group, Luke lost 0-4. 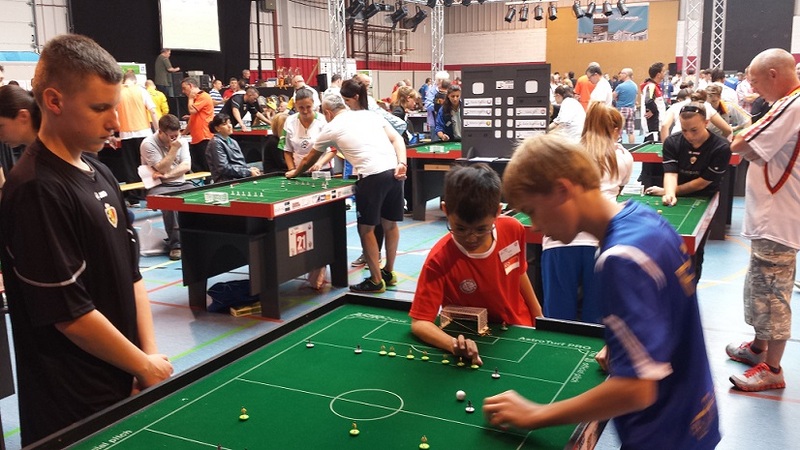 Though already knocked out, Luke did very well to wrap up his World Cup campaign with a 0-0 draw in his third and final game against Corentin Boltz, 1 out of 8 of the eventual Quarter-Finalists. 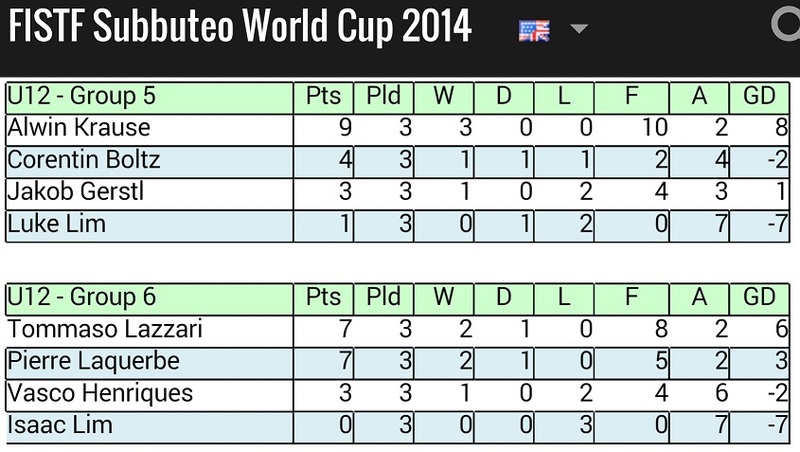 In so doing, Luke managed to record his first World Cup point and against a World Cup Quarter-Finalist at that!! Well done, Luke!! 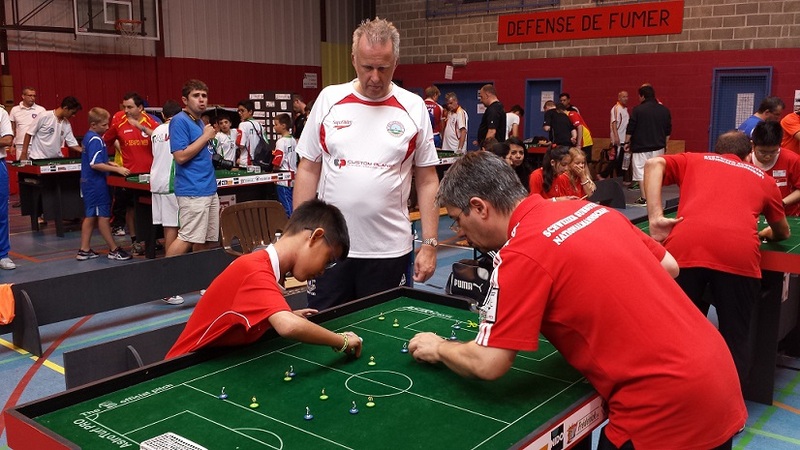 Also on his maiden World Cup campaign, Isaac’s first game was against Pierre Laquerbe. 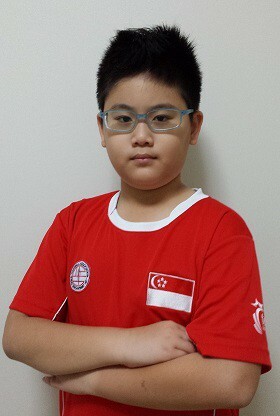 Unfortunately, unable to re-produce his form in Singapore tournaments leading up to the World Cup, Isaac lost the game 0-2. 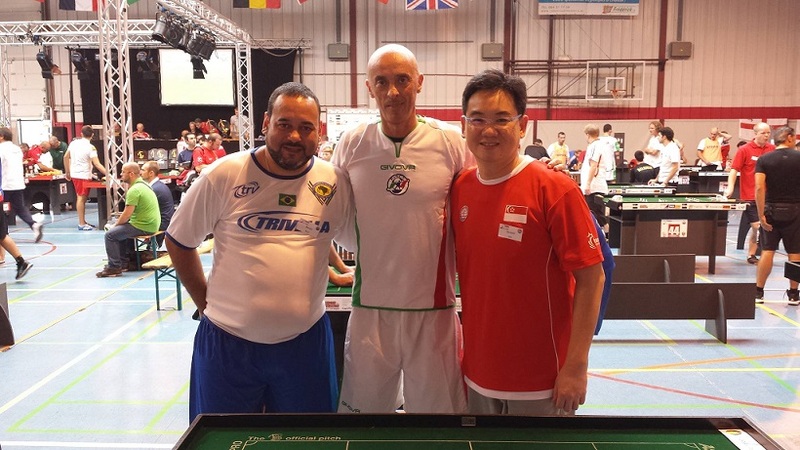 Next up for Isaac was the seeded player in the Group – Tommaso Lazzari. The game started quite evenly and Isaac had numerous chances to take control of the game as his opponent started the game nervously. Alas, Tommaso was more clinical with his shooting and once he scored the first goal, the result was never in doubt. In the end, Isaac lost the game 0-3. With 2 consecutive defeats, Isaac had only his third and final game to salvage some pride. His final opponent was Vasco Henriques and again Isaac had the chances to take control of the game as he started the game more strongly. However, his shooting let him down again and he ended up losing 0-2. It was unfortunate that Isaac ended up empty-handed with no goals and no points to show. 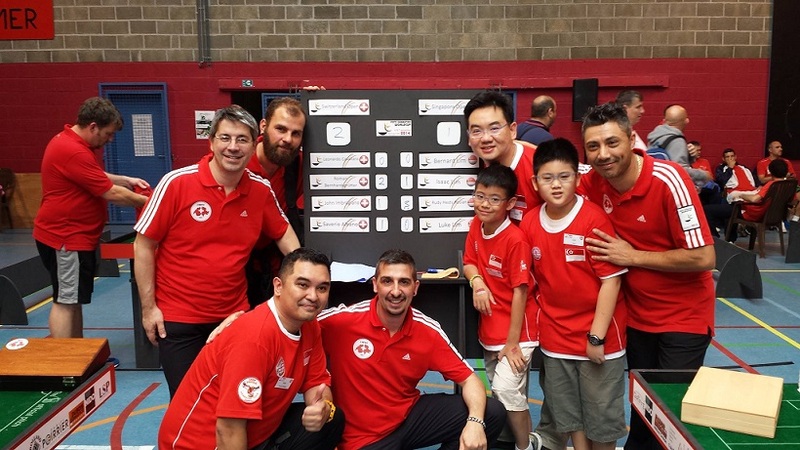 After the ups-and-downs of Team Singapore in the Individual events the day before; Rudy, Bernard, Luke and Isaac were slated for the Open Team Competition on the second day of play. 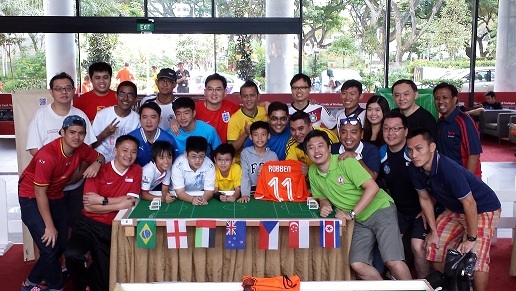 For Rudy, he had a fantastic day the day before and he was looking to build on it to further bring glory to Singapore. For Bernard, Luke and Isaac, they were looking for a much improved performance to redeem and give a better account of themselves. 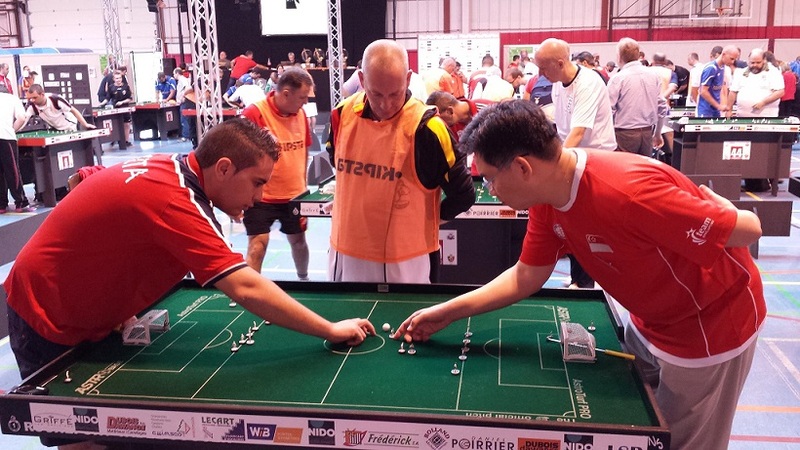 Singapore was drawn in Group 1 along with Spain (1 of the top Table Football nations), Gibraltar and Switzerland. 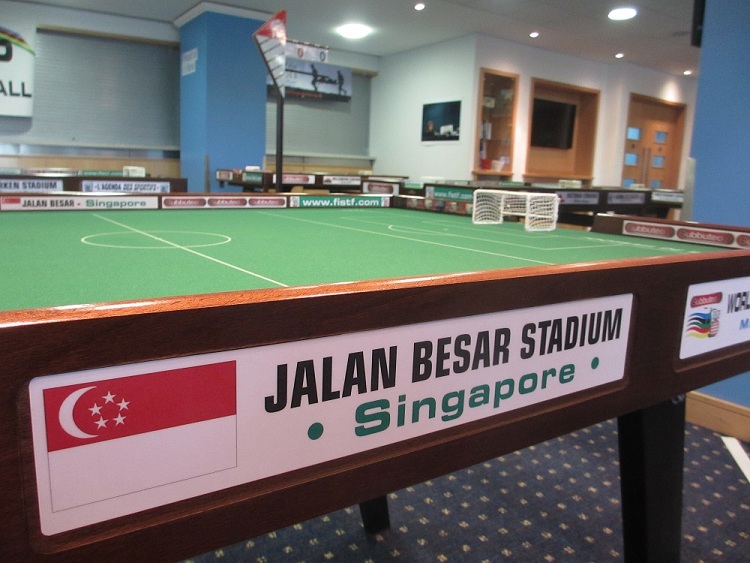 Singapore’s first match was against Gibraltar who was also made up of 2 adults and 2 youngsters to make for a evenly-matched contest. Bernard was up against Lawrence Alvarez (Rudy’s opponent in the Individual event); Rudy was up against Francis Avellano; while Luke and Isaac were up against fellow youngsters Niall Dean and Leon Avellano respectively. Both games involving the adults were tight affairs, as Bernard and Rudy were both edged out by the odd goal – Bernard by 1-2 while Rudy by 0-1. Luke also lost 0-2 to his slightly older opponent. Isaac, on the other hand, put up a great performance – finally scoring his first World Cup goals and securing his first World Cup point in the Team event as he drew 2-2 with Leon Avellano (the U12 World Cup Quarter-Finalist in the Individual Competition) to put away the disappointments of the day before. Well done Isaac!! 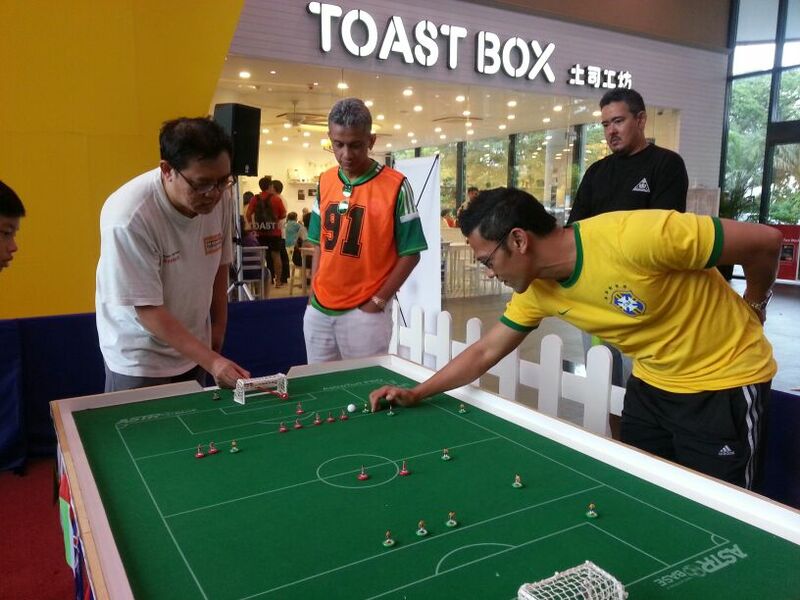 Singapore’s next match was against the No. 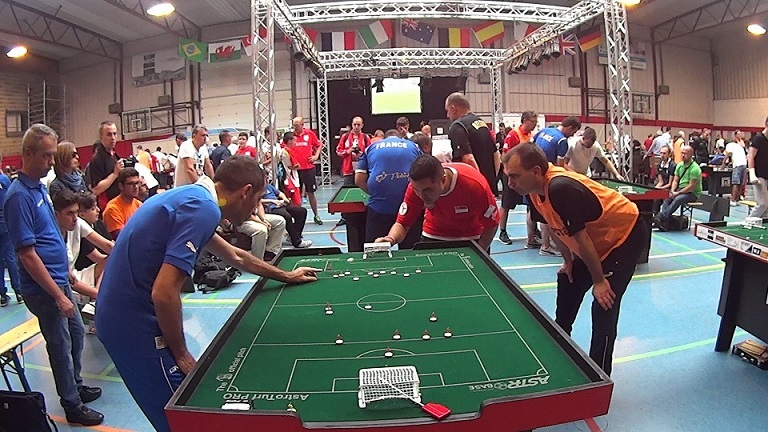 1 seed in International Table Football – Spain. Rudy played against Carlos Flores / Juan Manuel Noguera; Luke played against Alberto Mateos Navarro; Bernard played against Jose David Somoza; and Isaac played against Antonio Jesus Casin. 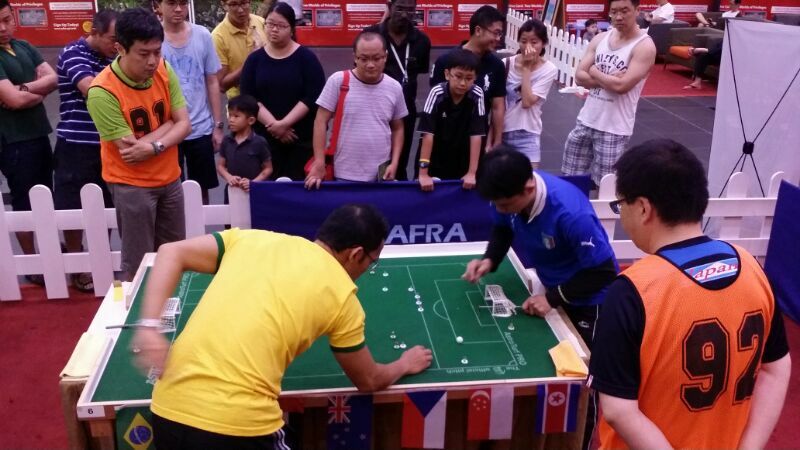 This match-up was more of a lesson in Table Football for the Singapore players. Except for Bernard’s game which was pretty well-contested with both players having clear-cut chances, the Spaniards comfortably won the other 3 games. 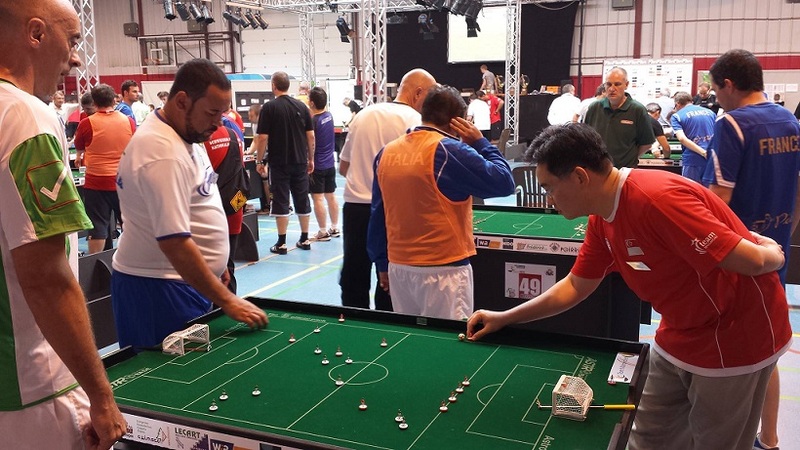 The final match for Team Singapore in the 2014 Rochefort World Cup was against Switzerland. Bernard was up against Leonardo Cavallaro; Isaac was up against Roman Bernhardsgrutter; while Rudy was up against John Imbrogiano; and Luke was up against Saverio Albano. 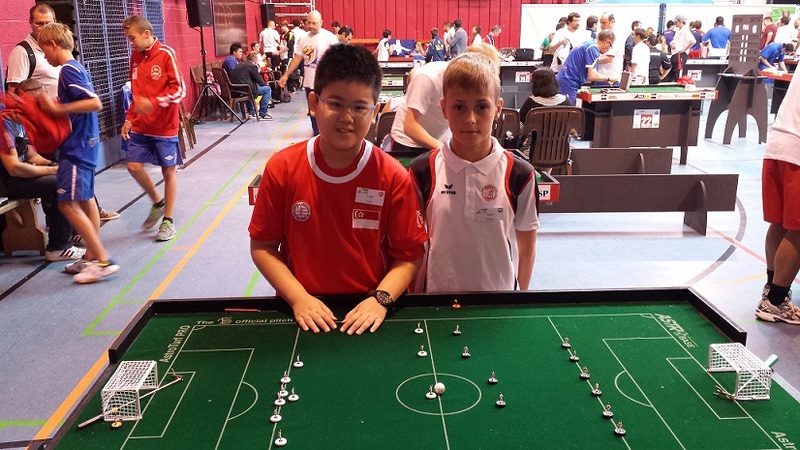 Our 2 youngsters did very well and both lost narrowly by the odd goal – Isaac by 1-2 and Luke by 0-1. 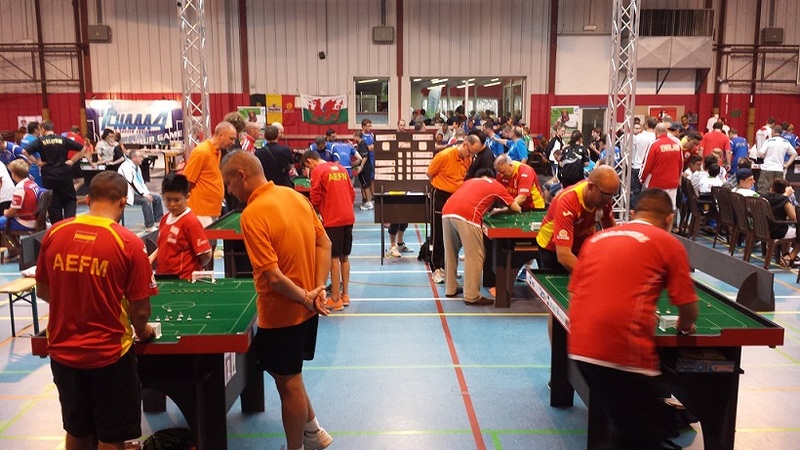 After their games, both of them felt that they could have actually beaten their Swiss adult oponents had they been more composed and more confident. Bernard fought out a tense 0-0 draw in a game which he had all the chances to score the winning goal to notch his 2nd World Cup game win. However, it was not meant to be as he squandered chance after chance and clearly left his scoring boots back home in Singapore. 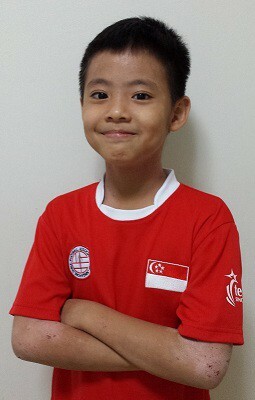 It was left to Rudy to salvage some pride for Team Singapore; as he secured Singapore’s first ever Team Competiton game victory by winning his game 3-1. 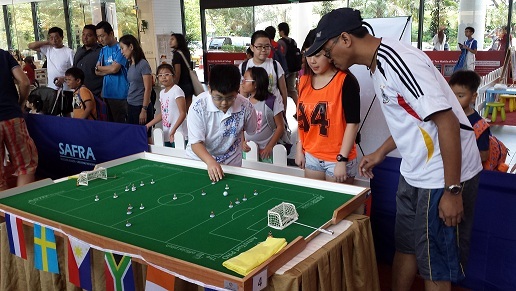 What a fantastic World Cup Rudy had as he continued to write his name in the annals of Singapore Table Football history with yet another fine performance in the Team Competition following his history-making showing in the Individual Competition. 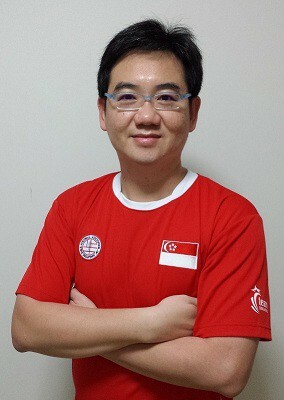 While Rudy was clearly the ‘star’ of Team Singapore at the Rochefort World Cup 2014, fulfilling both his personal targets and also that of the nation, it is worth highlighting the laudable efforts of the other 3 players who though not as successful, also contributed to the success of Team Singapore … Bernard met his personal target of scoring his first World Cup goals and securing his first World Cup game victory in the Open Individual event. 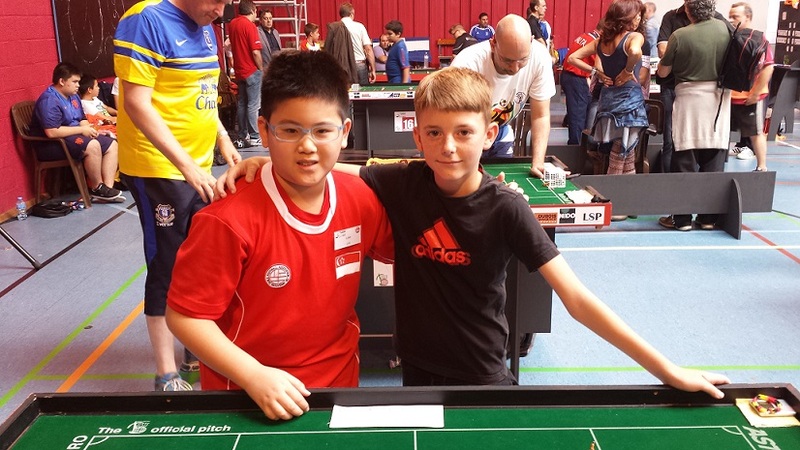 Luke also met his personal target of securing his first World Cup game point in the U12 Individual event and scoring his first World Cup goals in the Open Team event. And Isaac also met his personal target of scoring his first World Cup goals and securing his first World Cup game point in the Open Team event. 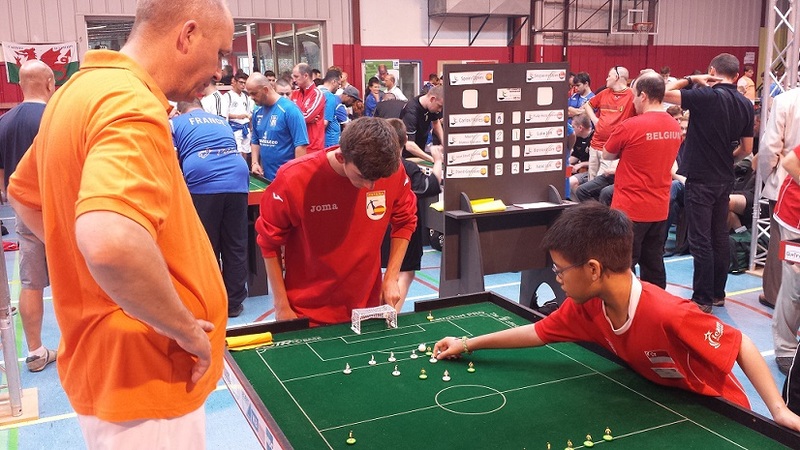 Question: How would you describe your personal experience of representing your country in the Rochefort World Cup? Rudy: Unbelievable dream come true. Felt like a young teenager going out on a 1st date, nervous yet passionate with the will to try to impress. 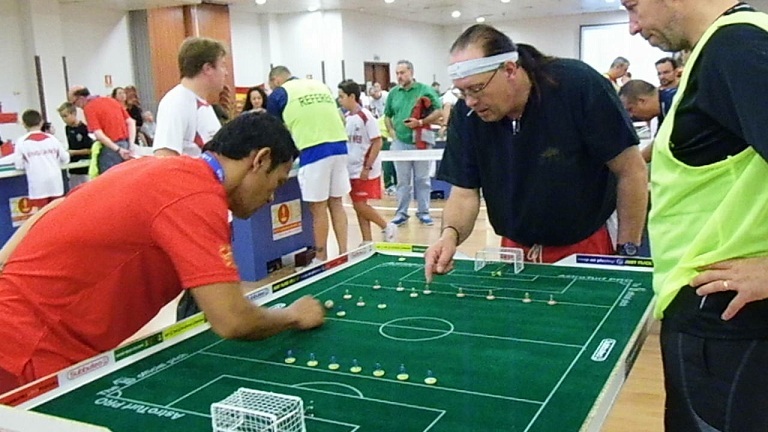 Meeting all the big names in the modern Subbuteo and getting the chance to play competitive games (to name a few) with great players like Carlos Flores, Saverio Bari, Juan M Noguero and friendlies with legends players like Massimo Bolognino and Daniel Scheen plus Ladies top player, Trish Baumeler, and the most important of all was making many new friends and strengthening ties with the Subbuteo families from various part of the world, which really made the cross-continent, 16-hours journey a worthwhile and lifetime experience. Bernard: Simply ecstatic!! 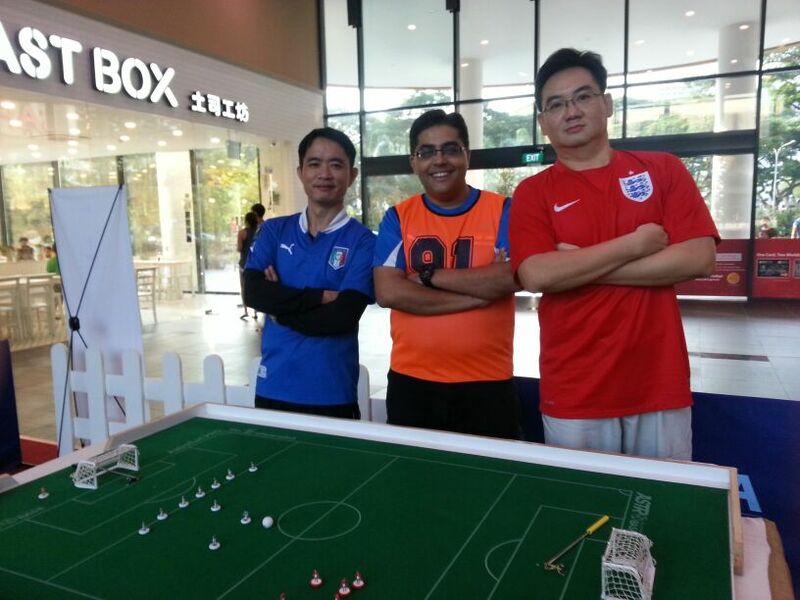 … a boyhood dream come true to finally become a National Player representing Singapore in the Subbuteo World Cup!! For 2 days, I was living the dream of a ‘professional player’ playing for his country – this has been my dream since I was a little boy at the tender age of 9. 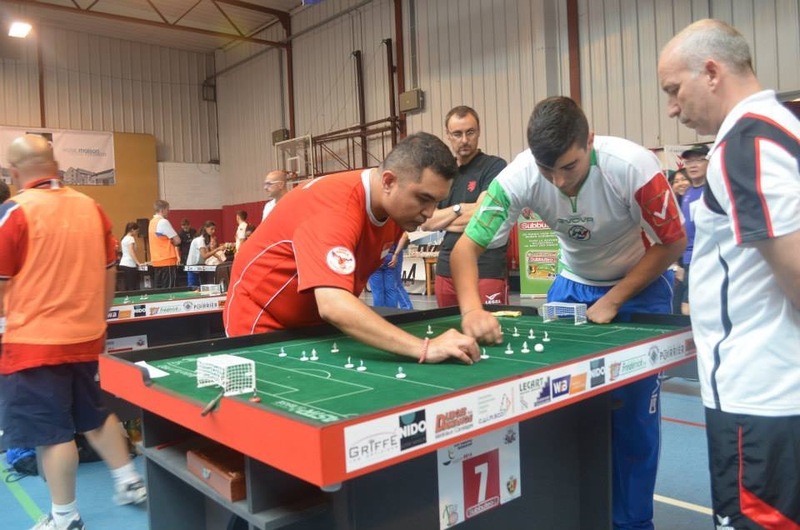 To have finally achieved and done it on the biggest stage in International Sports Table Football (at the World Cup) is something that I will remember for life!! 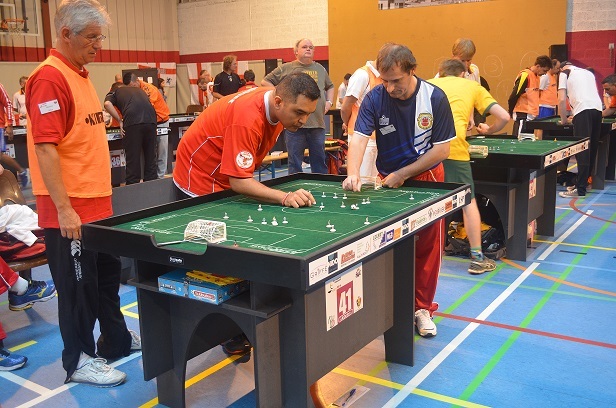 It has also been a very humbling learning experience for me; but it is an experience that made me better in terms of Table Football. 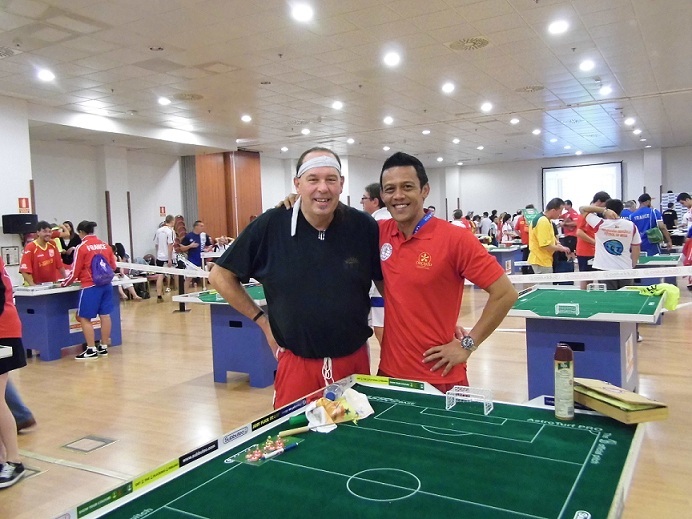 I also met many new like-minded friends from around the world and had numerous friendly games with them – a great opportunity and an unforgettable experience!! 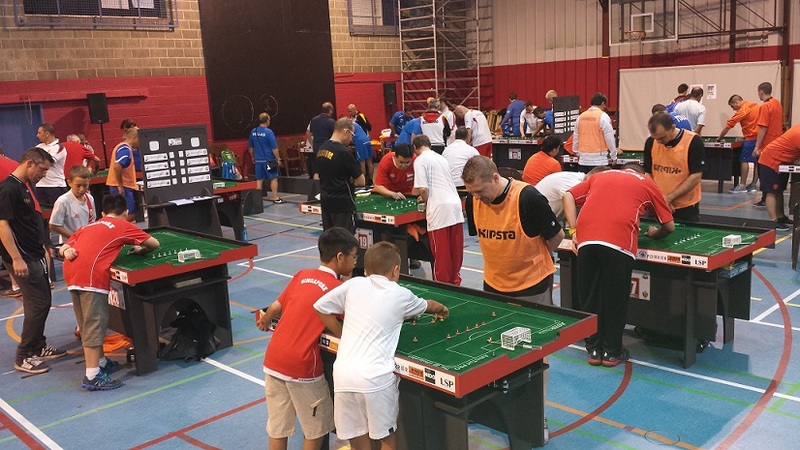 Luke: The experience makes me feel proud to represent my country in the topmost level of Sports Table Football and make new friends from not only a different country, but from a different continent as well. On overall, it was awesome. Isaac: It was an exciting, fun and enjoyable experience. 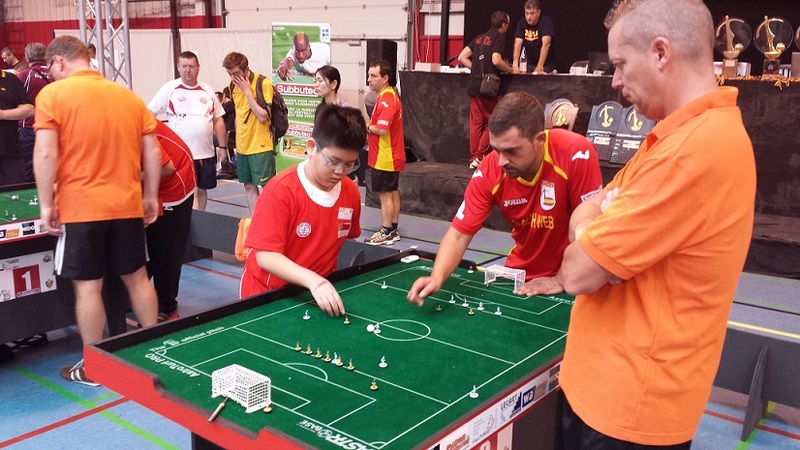 It was also a good experience to play against older and better opponents. Question: Would you recommend other players to play in the World Cup? Why? Rudy: Definitely yes, but be prepared mentally and physically. Mentally for the tough games you will encounter; you could end up being hammered by your opponents, personal experience – 0-6, 0-8 against the Italians & 3-8 against the Spanish 😉 . Physically for the long journey and quick succession of games. Nevertheless, all this are minor setbacks compare to the wealth of experience you will gain, by playing against world class players and watching the best playing. Bernard: A BIG definite YES. For me, it was priceless to play against the best players in the world and to see up-close the difference in playing standards; the focus and concentration levels; and the speed and accuracy of these top players. I definitely learnt a lot and benefitted from playing in the World Cup as it made me more aware of the finer details of the game and more importantly, made me realise the areas in my game that needs further improvement. I strongly believe the experience of playing in the World Cup has made me a more confident and better player. You also get to make many new like-minded friends from all over the world; which is another added bonus. I am sure other players would similarly reap the same benefits. Luke: I will recommend other players to play in the World Cup as it shows that the popularity of the game is increasing in Singapore despite the electronic and console games that we have today. Isaac: Yes, because you can learn from the experience of playing against older and better opponents; and improve yourself and become a better player. You can also make a lot of new friends. 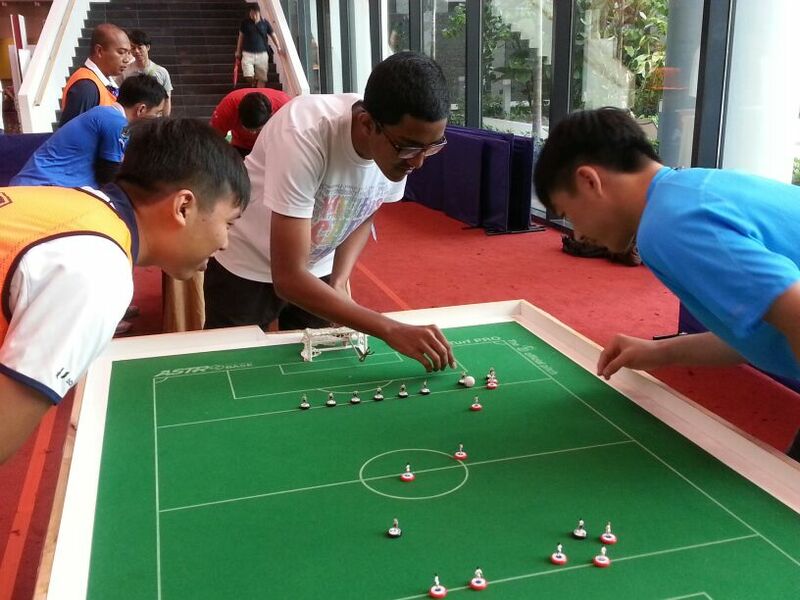 Question: Would Singapore Table Football benefit from having players in the World Cup? Why? 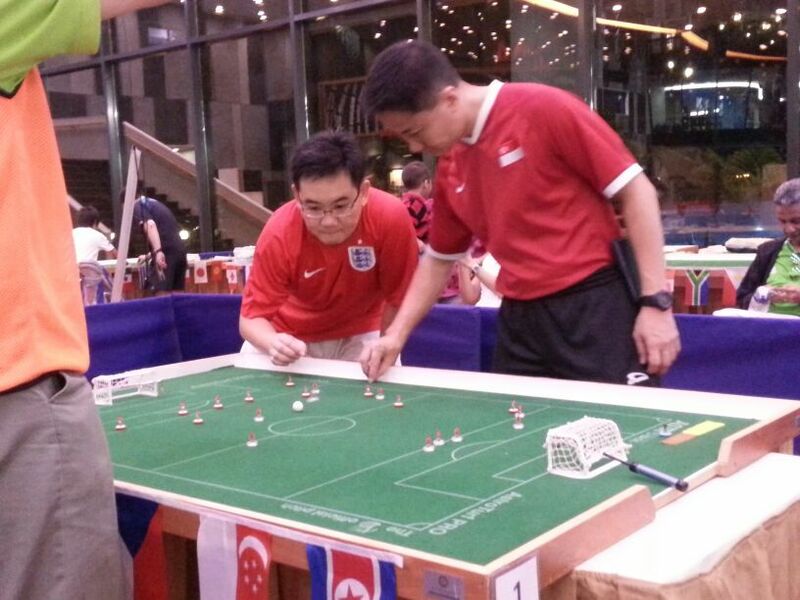 Luke: I think that Singapore Table Football will benefit from having players at the World Cup as you are placing you country’s name on the world map of Table Football and it will especially increase the number of junior players to play Table Football as this is the first time that TFAS is sending junior players to play at the topmost level of Table Football in the world. However, it would be better if we could get sponsorships to broadcast the our games so as to attract more people to play the game. Isaac: Yes, because you come back from the World Cup a better player and may also beat older local players. This encourages other Junior players to also try and follow your example and improve themselves to beat older players. 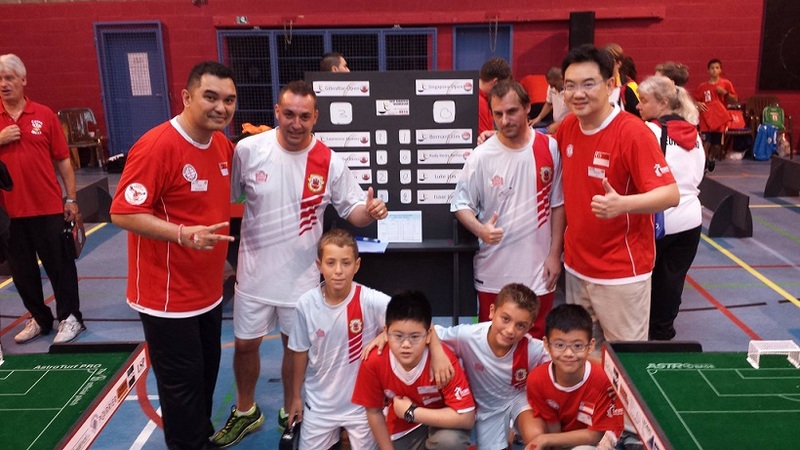 Last but not least, TFAS would like to commend the fantastic efforts of all 4 players of Team Singapore; and to congratulate and thank them for putting Singapore firmly in the World Map of International Sports Table Football!! … Well Done, Congratulations and Thank You!!! 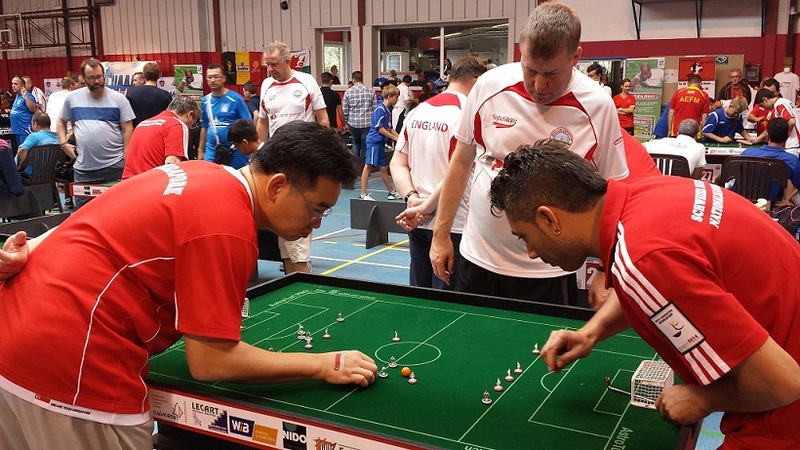 As we continue the count-down to the Rochefort World Cup 2014 this coming weekend, we take a look-back at the exploits of Team Singapore in past FISTF Subbuteo World Cup tournaments since the formation of TFAS back in 2009. 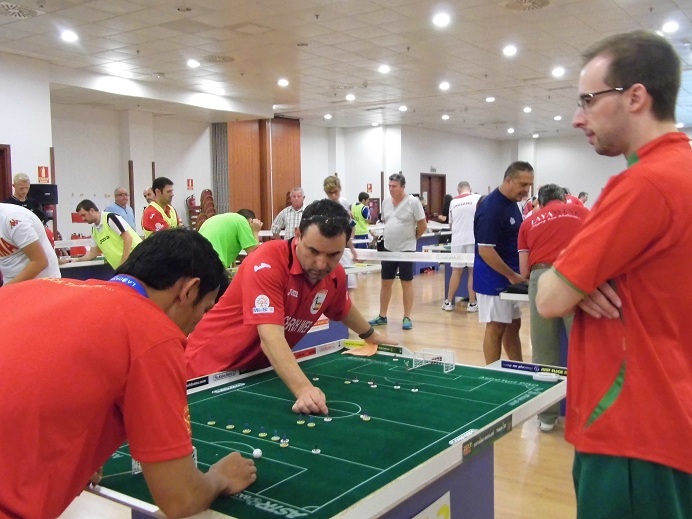 In this last of 2 instalments, we focus on the FISTF Subbuteo World Cup 2013 held in Madrid, Spain. 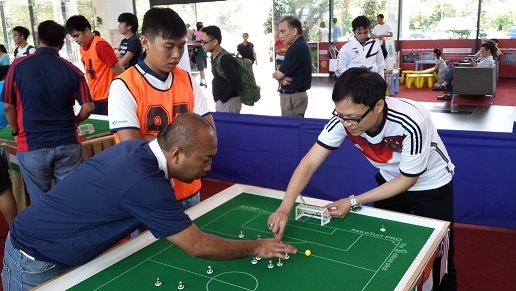 TFAS sent its second delegation (since the formation of TFAS) to the Madrid World Cup in 2013. Singapore was proudly represented by our Singapore Champion Den Mulia Yusni. 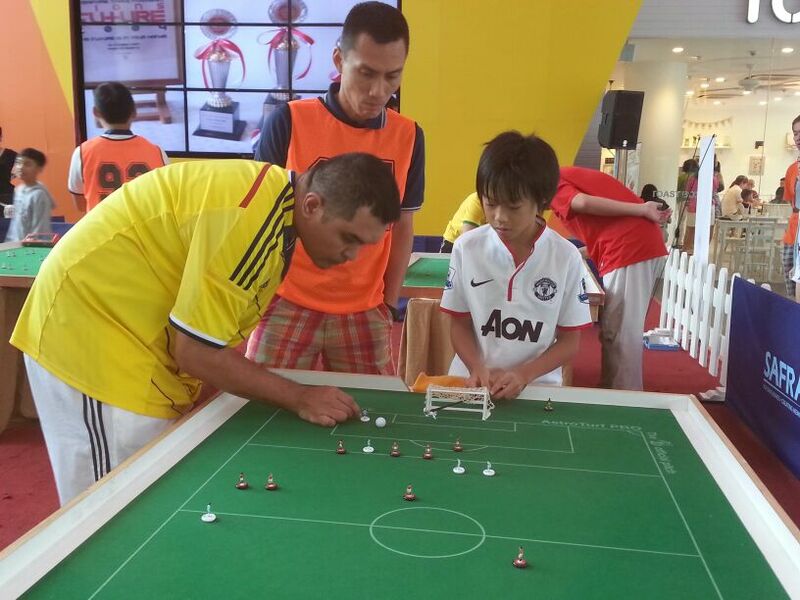 Well known to all in the local table football community, Den Mulia is our undisputed No. 1 top-ranked player in Singapore; and probably Asia’s No. 1 player as well!! 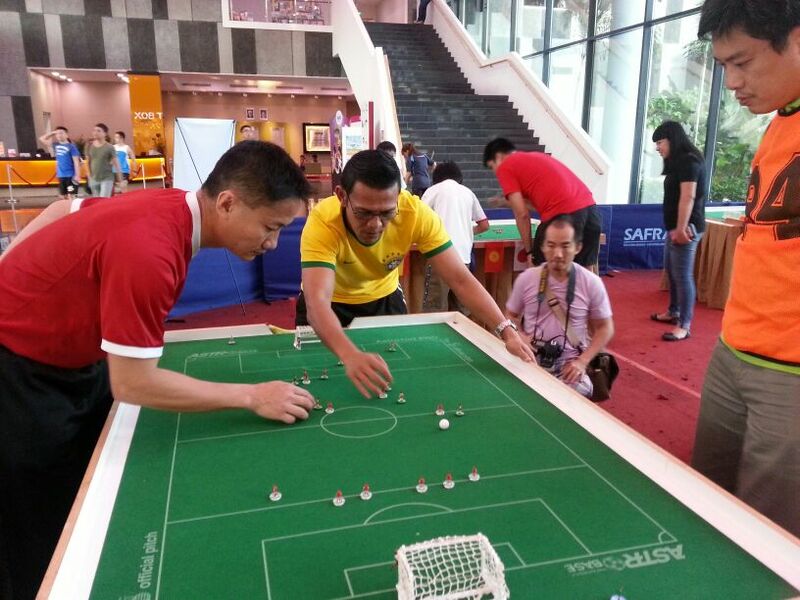 Many old-timers and veterans would know that Den Mulia had actually represented Singapore several times in past World Cups under the ambit of the now-defunct Subbuteo Association of Singapore. This is, however, his first appearance under the ambit of TFAS. 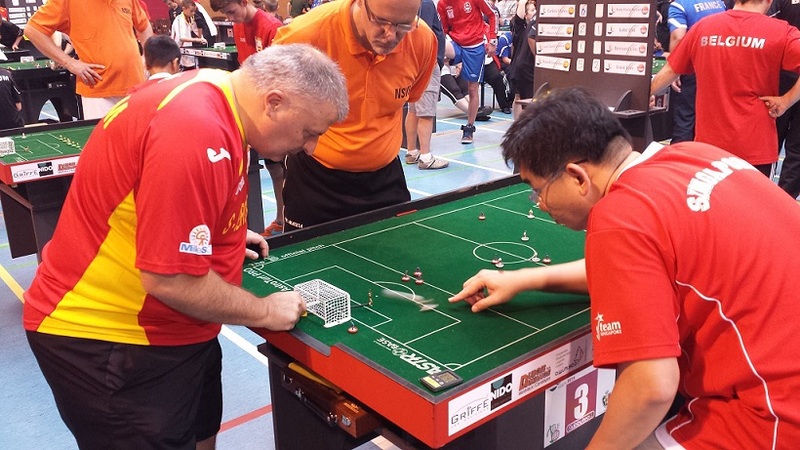 His participation further raised the profile of Singapre table football to the rest of the world – further building on the great work Kok Wee Tan and John Ho had started the year before in Manchester, England. 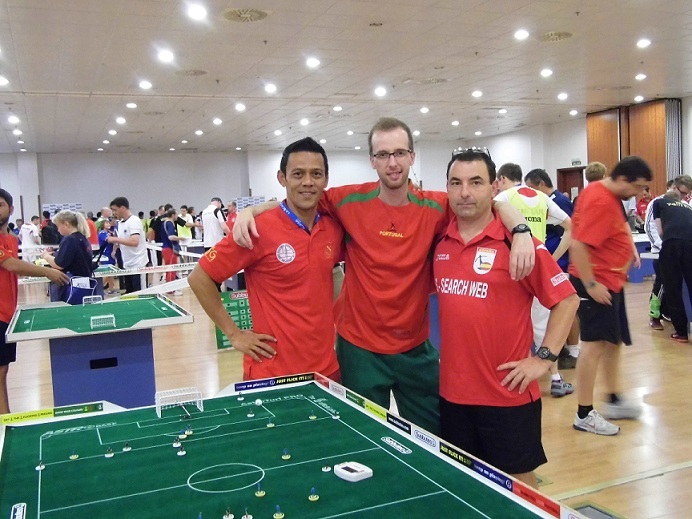 Den Mulia competed in the Individual Veteran event and was drawn in the same group together with Maxwell Gautschi (Switzerland), Luili Lopez (Spain) and John Field (Gibraltar). Den Mulia got his World Cup campaign off to a great start when he recorded Singapore’s first ever win in a World Cup game in the TFAS era!! He comfortably defeated Maxwell 4-1. Unfortunately, that victory, in a way, also made Luili and John took notice of our Champion from the little island of Singapore. 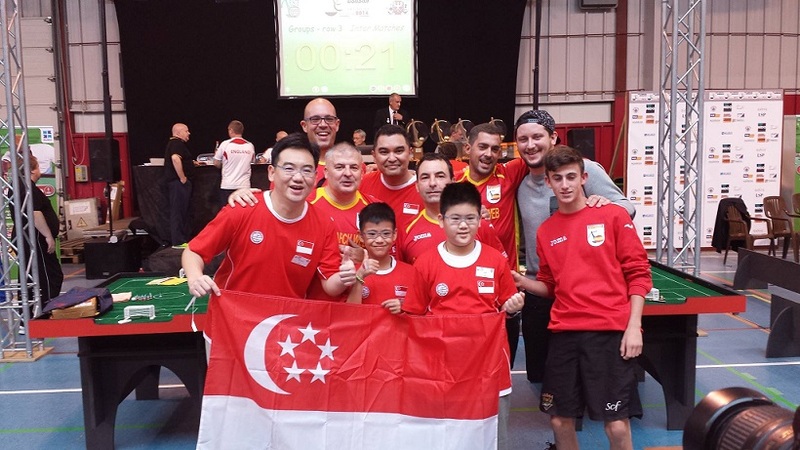 They subsequently up the ante and raised their game as they took on Den Mulia, mindful of the quality of our Singapore Champion and careful not to allow further upsets and surprise results from Singapore. In the end, against stronger opponents at the top of their game, Den Mulia lost the subsequent 2 games – 0-3 to Luili and 0-6 to John. While a single victory with 3 points was not enough to progress to the next round, Den Mulia has certainly created a stir and made a name both for himself and Singapore. 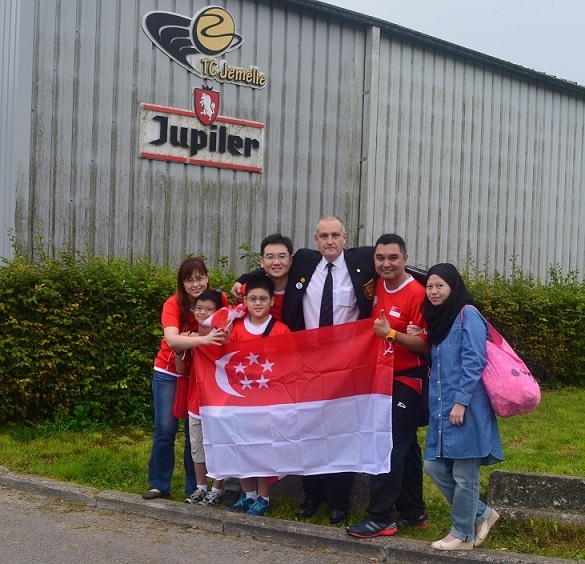 While Kok Wee and John had planted our Singapore flag and fly it high in the 2012 Manchester World Cup the year before; what Den Mulia had achieved in the 2013 Madrid World Cup effectively raised the Singapore flag and flew it even higher!! Great job Den Mulia!! Question: How would you describe your personal experience of representing your country in the Madrid World Cup? Den Muila: The experience was priceless as you are up against some of the best players in the world. Gives me pride to wear the national colours. Den Mulia: It will be great for players to experience the World Cup as it is run professionally and especially seeing the drama and excitement!! 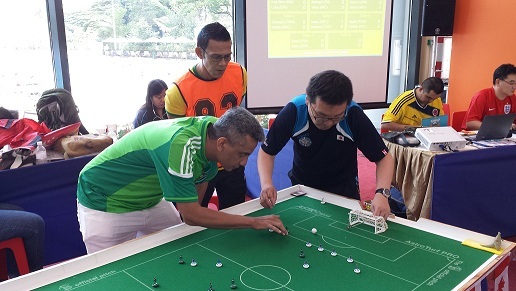 Den Mulia: Singapore Table Football players will definitely benefit competing in the World Cup as it will tremendously improve their game as the level is so much higher. 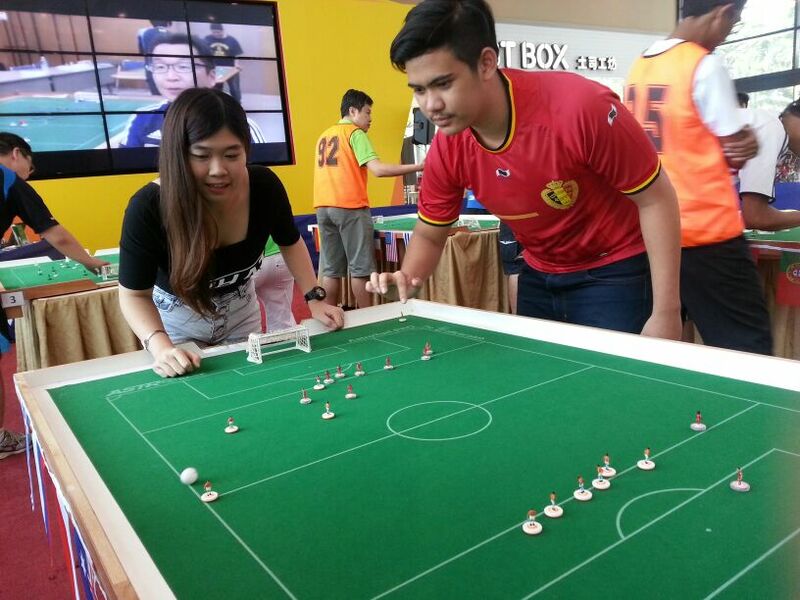 Lastly, a BIG congrats to Den Mulia and thank you for your contributions to help raise the profile of Singapore Table Football at the World Cup and to make the rest of the world noticed us!! Well done!! 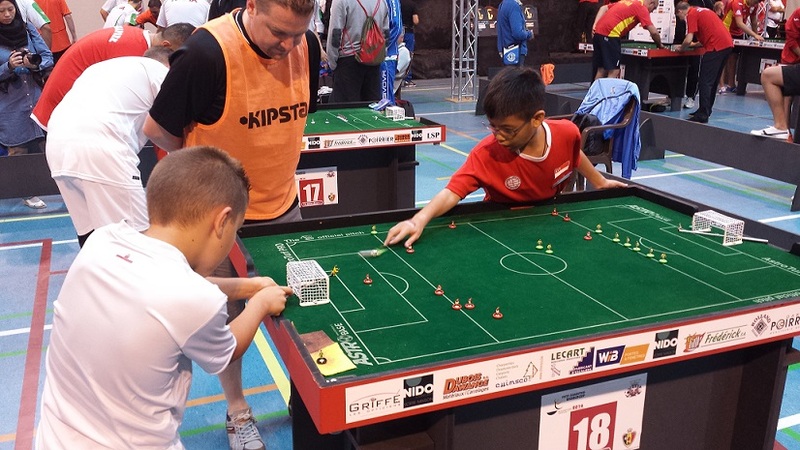 Continue to watch this space as we bring you the exploits of Team Singapore at the FISTF Subbuteo World Cup 2014 in Rochefort, Belgium after this weekend!! 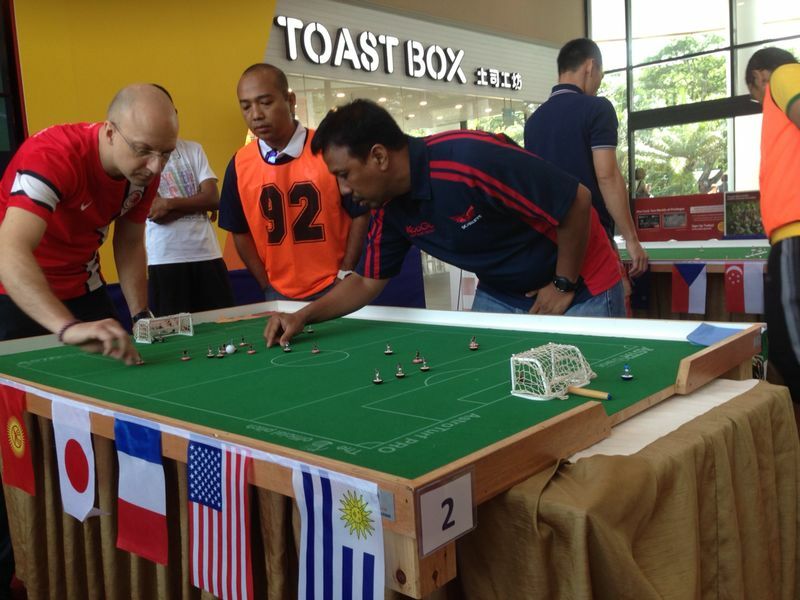 As we count-down to the Rochefort World Cup 2014 this coming weekend, we take a look-back at the exploits of Team Singapore in past FISTF Subbuteo World Cup tournaments since the formation of TFAS back in 2009. 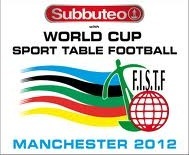 In the first of 2 instalments, we focus on the FISTF Subbuteo World Cup 2012 held in Manchester, England. 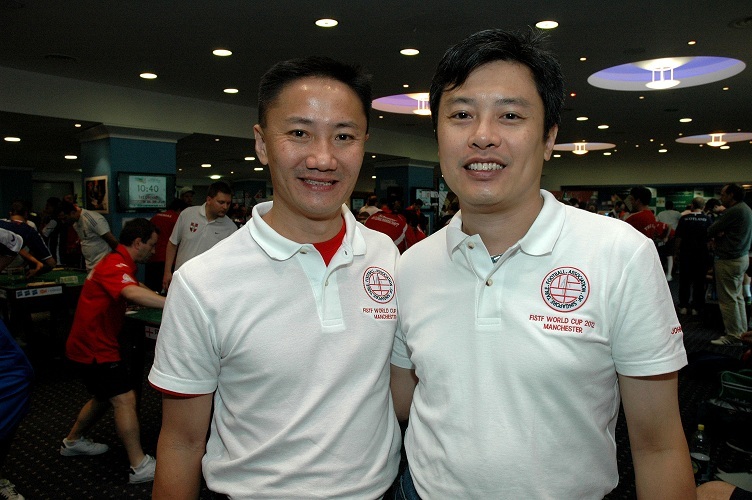 Singapore’s very first representatives (since the formation of TFAS) in a FISTF World Cup was none other than Kok Wee Tan (our TFAS President himself) and John Ho (our TFAS Treasurer). 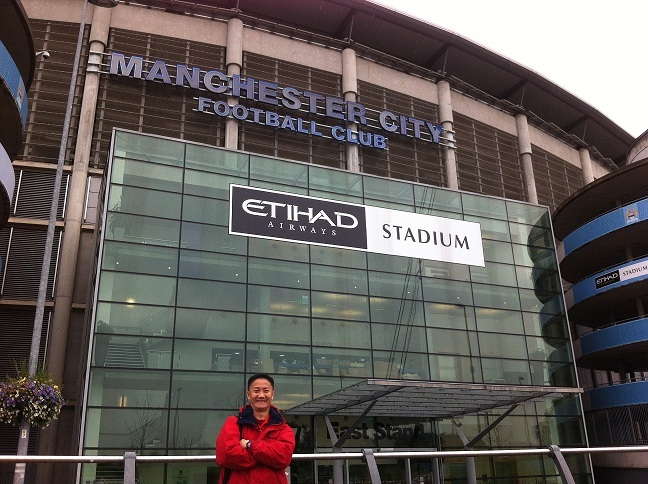 As ardent fans of the English Premier League themselves, they jumped at the opportunity to not only represent Singapore in the World Cup in Manchester but also to tour 1 of the key hotbed of English football and to visit the Etihad Stadium – home of Manchester City!! 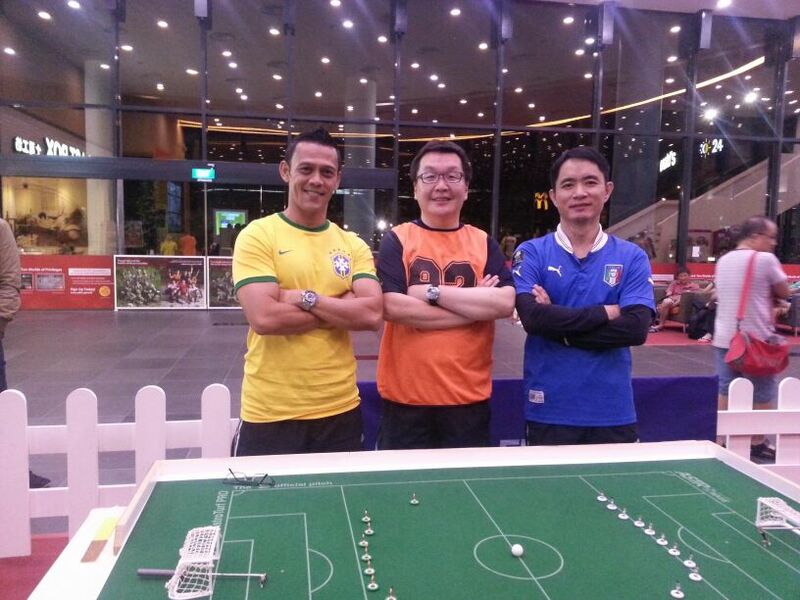 For both Kok Wee and John, this was their maiden World Cup appearance as national players of Singapore. 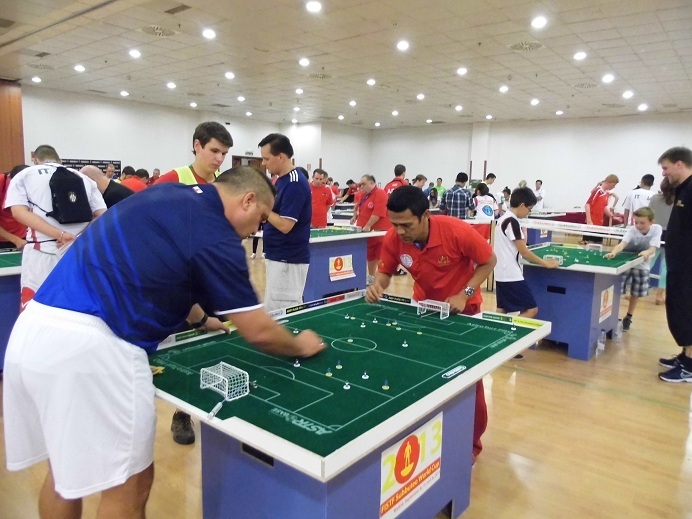 Their participation put Singapore on the world map of Sports Table Football and tremedously helped raised the profile of Singapore table football and attracted the attention of the rest of the table football community around the world. 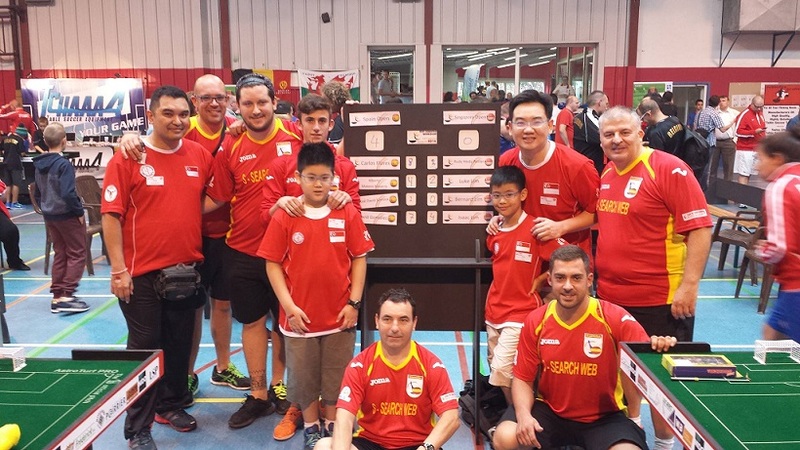 Kok Wee was up against Daniele Bertelli (Italy), Jesper Staal Nielsen (Denmark) and Nikos Pappas (Greece) in his group; while John was drawn together with Samuel Bartolo (Malta), Lawrence Alvarez (Gibraltar) and Kostas Stamokostas (Greece). Both of them competed in the Individual Open event. 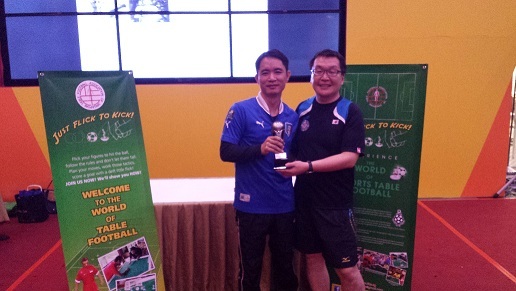 While Kok Wee did not win or draw any of his games, he did managed to score his first World Cup goal and put up a credible performance. John went 2 steps better and scored 3 World Cup goals. Unfortunately, both of our players could not progress beyond the Group Stage against much stronger opponents. Nevertheless, both certainly left their mark on the world stage and made many sit-up and notice. 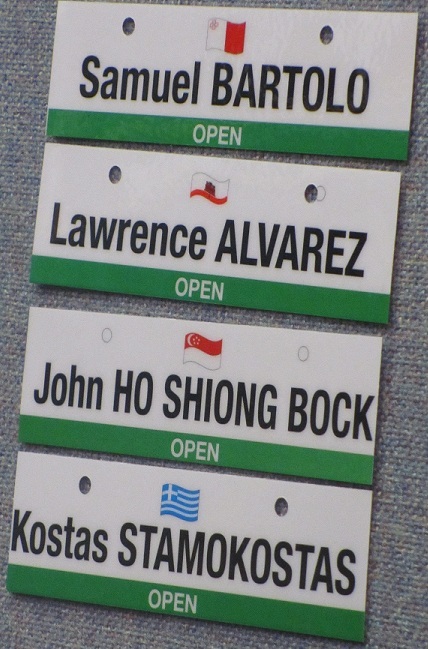 In fact, over the course of the tournament weekend, both Kok Wee and John had numerous invitations for friendly games from many of the top players around the world; curious about the style and standard of play of Singaporean players. 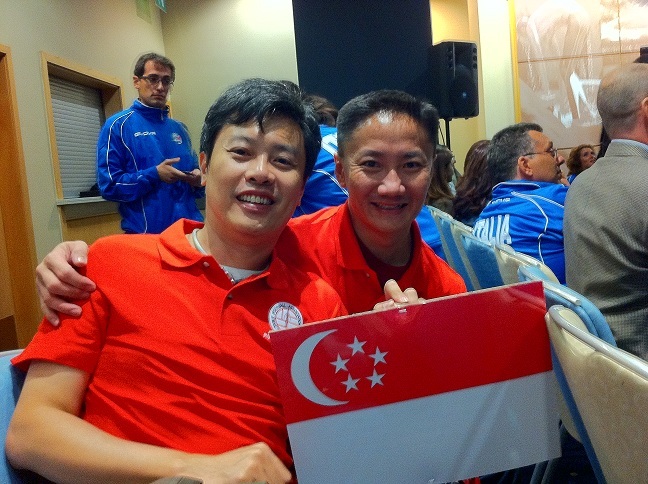 Well done Kok Wee and John for flying our Singapore flag high and proud!! Question: How would you describe your personal experience of representing your country in the Manchester World Cup? 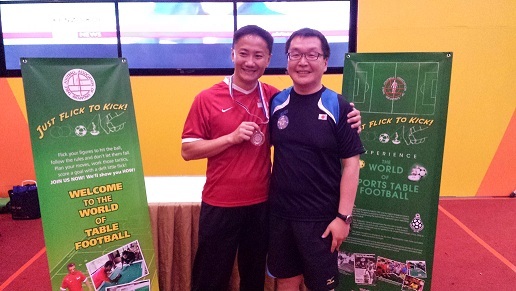 Kok Wee: It was definitely a proud moment of being recognised as a representative of my country in such a global event. Having other players from other countries welcoming us was indeed very heartwarming; and for all that to happen in Manchester, it was really a childhood dream coming true – for Manchester of UK is THE place that I always wanted to visit ever since I started to know football. 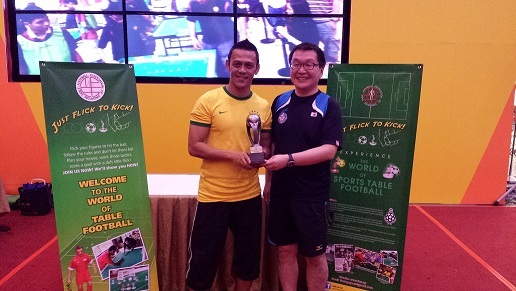 Kok Wee: I would definitely and strongly encourage other players to go play in the World Cup whenever they can. 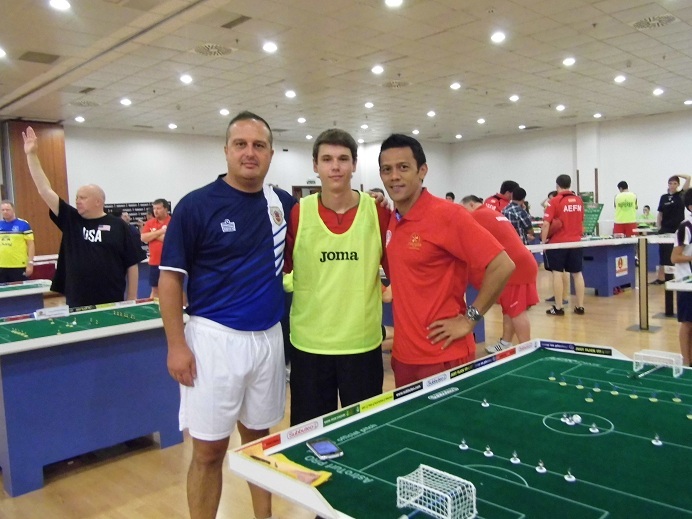 The experience of watching and playing with some of the world’s top players will be a very good learning process. Results aside, to be able to interact with players of other countries is also a very enriching experience; and not to mention the friendships forged in the process is simply priceless! Kok Wee: Of course!! 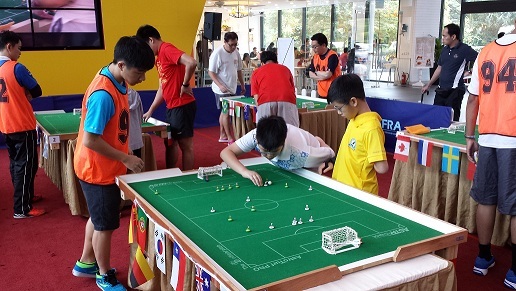 Singapore Sports Table Football will surely benefit having in the World Cup – for these players will return with really fruitful experiences and advice that can help build the other players here in Singapore. 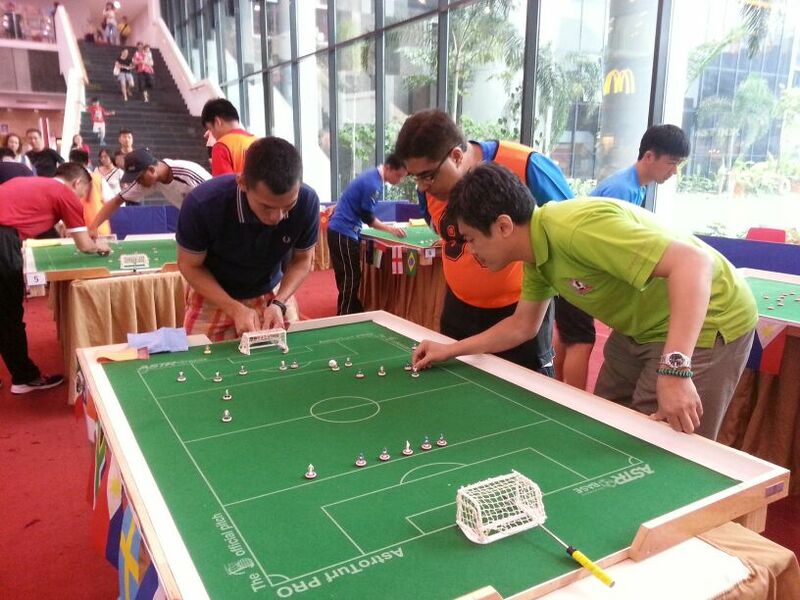 This os 1 of the best – if not the best – way in which this Sport can grow not only in Singapore but the whole of Asia region. And of course, it is yet another avenue that our little island can be featured on the world stage. 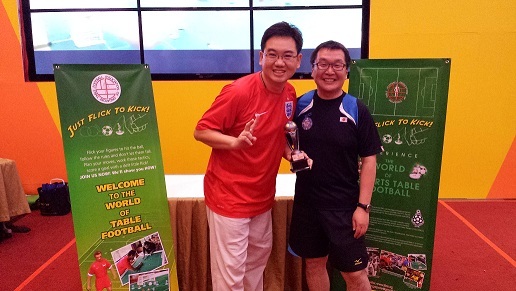 Last but not least … Congrats and kudos to both Kok Wee and John!! 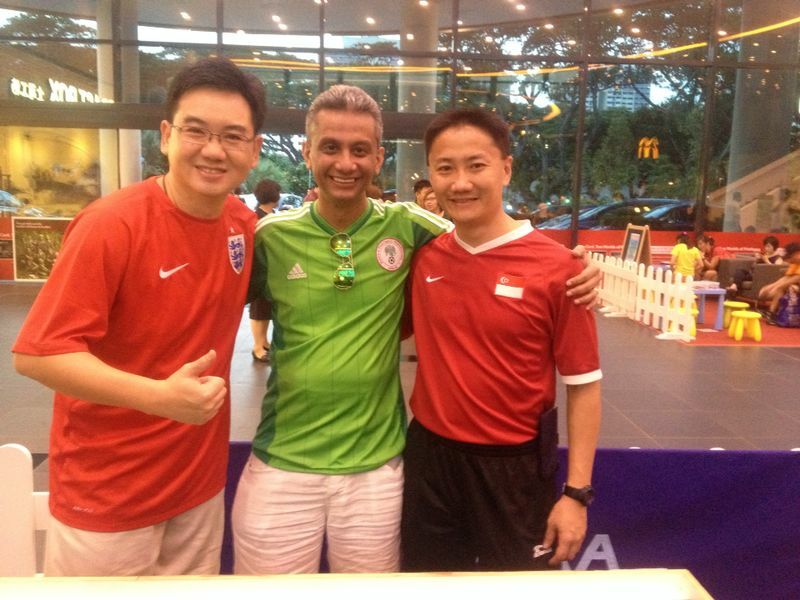 You have both done Singapore proud!! Well done!! 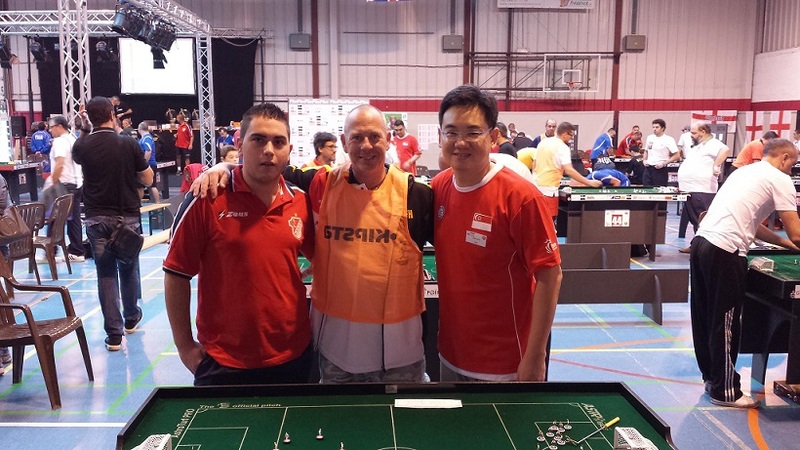 In the next instalment, we focus on the exploits of Team Singapore at the FISTF Subbuteo World Cup 2013 held in Madrid, Spain. Watch this space!! 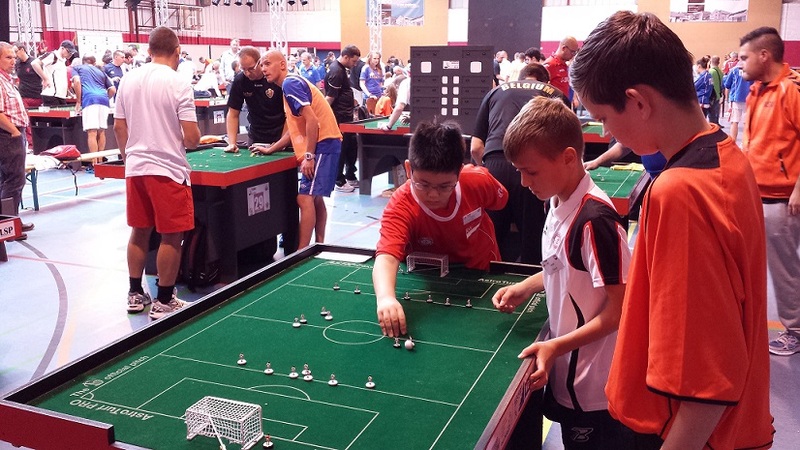 TFAS is pleased to announce the participation of Team Singapore in the FISTF Subbuteo World Cup 2014 on the 6 – 7 September at Rochefort, Belgium. 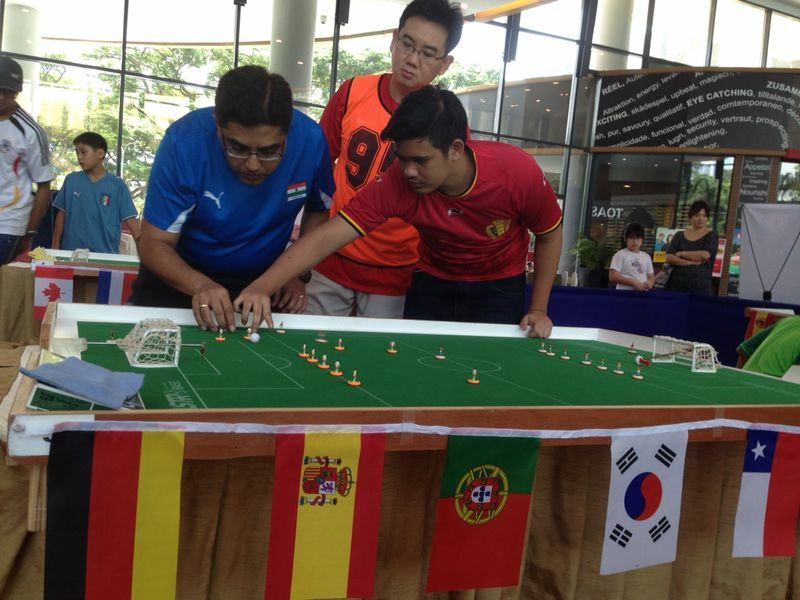 This is the first time in the history of local table football that a Team from Singapore is competing in the Team Competition event. 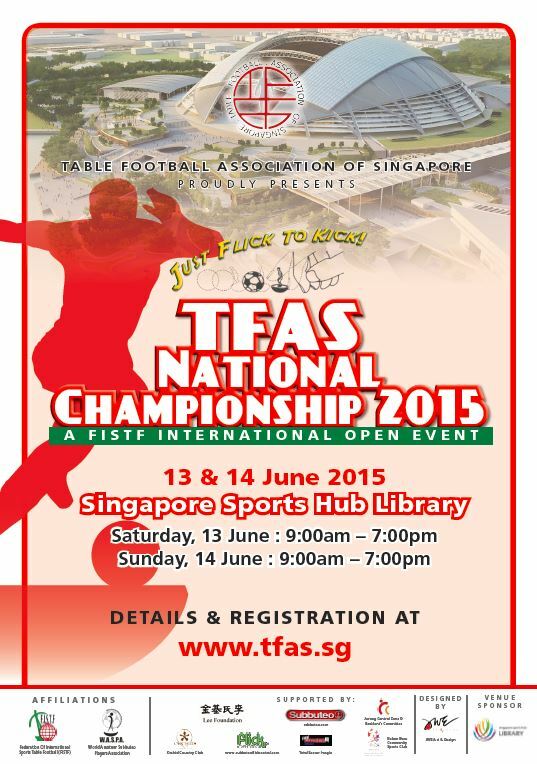 It is also the first time that TFAS is sending Junior players to the ‘Under-12’ event. 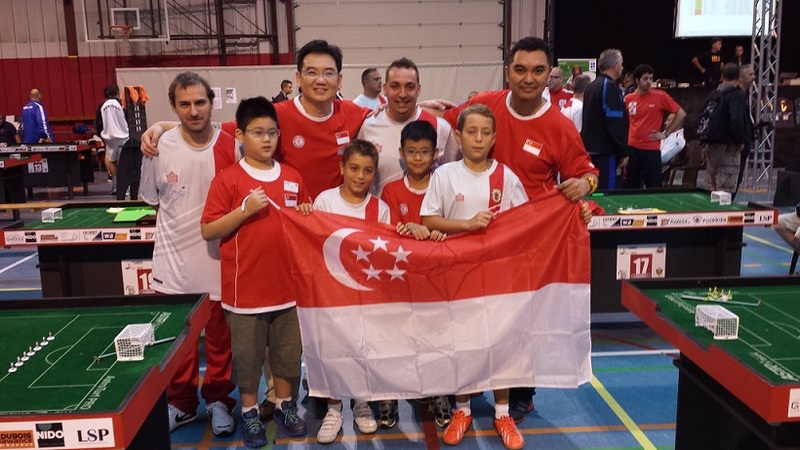 Team Singapore comprises of Rudy Hesty Roselan, Bernard Lim, Luke Lim and Isaac Lim. Representing our country, the team will be playing in the ‘Open’ category of the 16-nation Team Competition event against the very best nations from around the world. In fact, Singapore is the only nation outside of Europe/Americas and also the only nation from Asia to participate in this year’s Team Competition event. 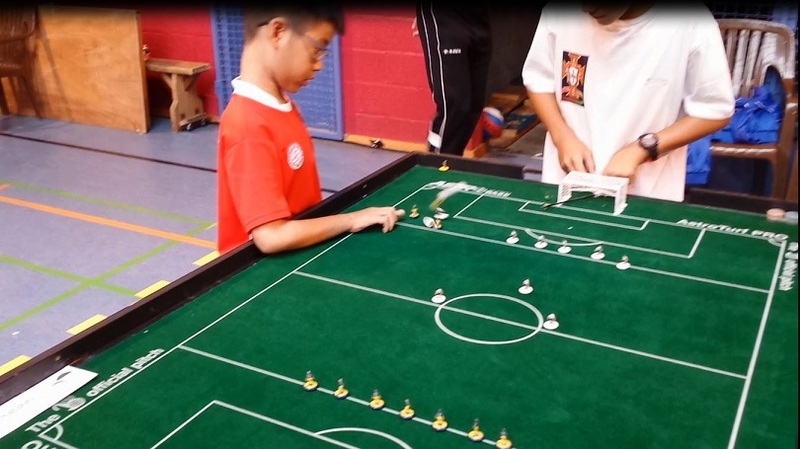 Largely still an experimental/development team – with 11-year-old Luke and 8-year-old Isaac teaming-up with adults Rudy and Bernard – the Team hopes to gain invaluable experience and exposure by playing against some of the very best in the world of Table Football. TFAS applauds the courage of our 2 Junior players who are undaunted with the prospect of playing against adult players. 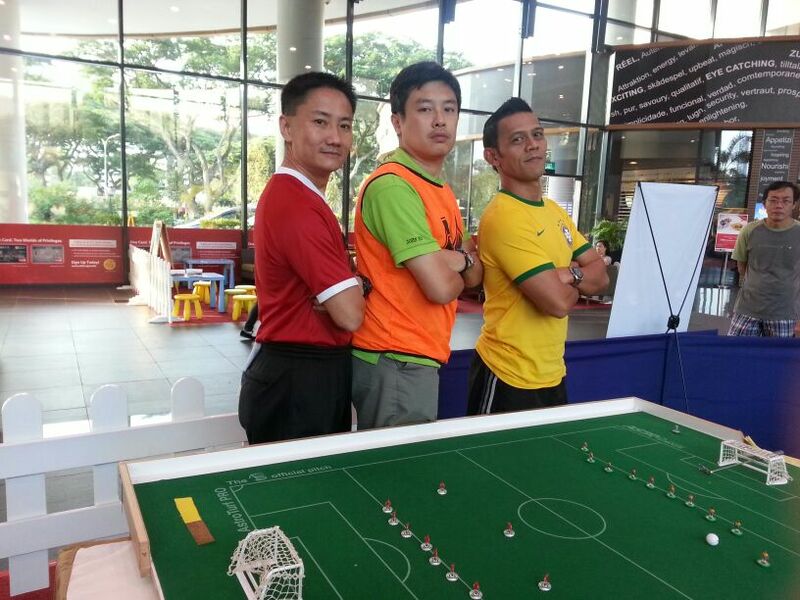 Our players will also be representing Singapore to participate in the Individual Competition event. 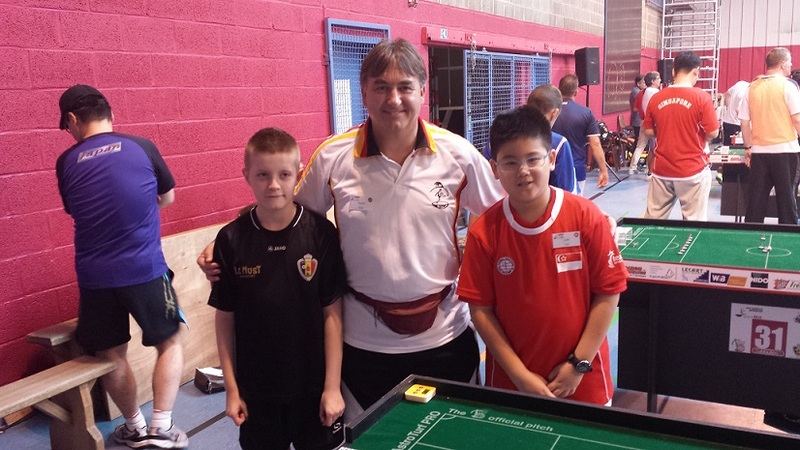 Rudy and Bernard will compete in the ‘Open’ event while Luke and Isaac will compete in the ‘Under-12’ event. 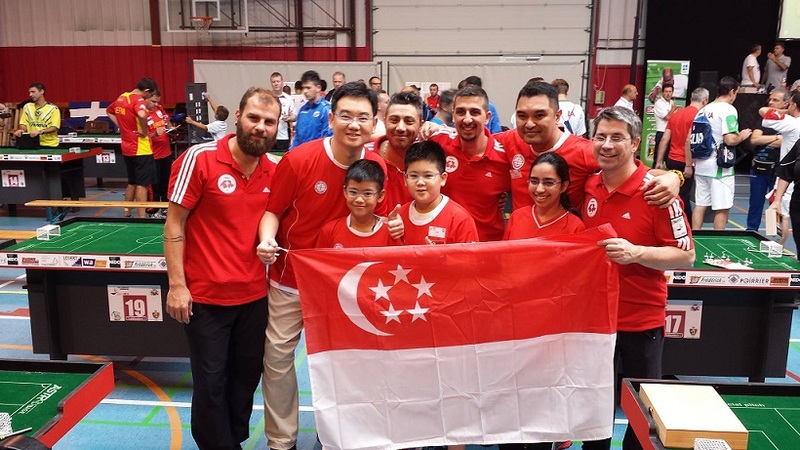 TFAS wishes our World Cup players the very best in Rochefort, Belgium; and hopes that they carry the Singapore flag high and do our country proud!!! 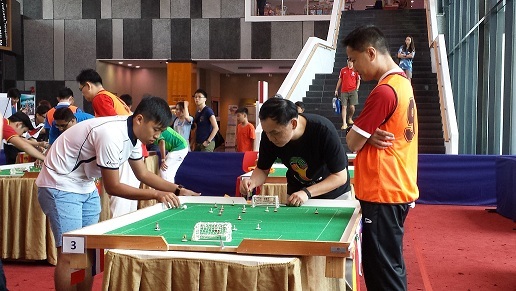 Started playing in 1989 with groups of friends from the east of Singapore, Rudy Joined his first tournament in the Singapore Junior Nationals aged 14 and managed to get Third placing. He went on to play for another year or two before the game faded off in Singapore. In 2010, Rudy managed to stumble back into the game at Orchard Central where he was introduced back into the game by TFAS buddies. His most memorable event is winning the TFAS Futures in 2010 against a field of seasoned players. 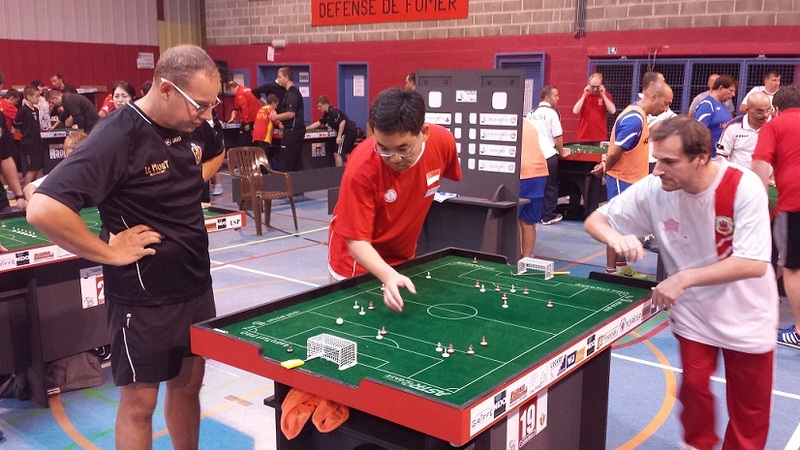 Rudy aspires to play in the FISTF World Cup; with the dream nearly coming through this year at Rochefort. Through the game, he hopes to continue making lots of friends and to continue playing even after retiring from his full time job. First started playing the game as a 9-year-old boy back in 1981 with his older brother. 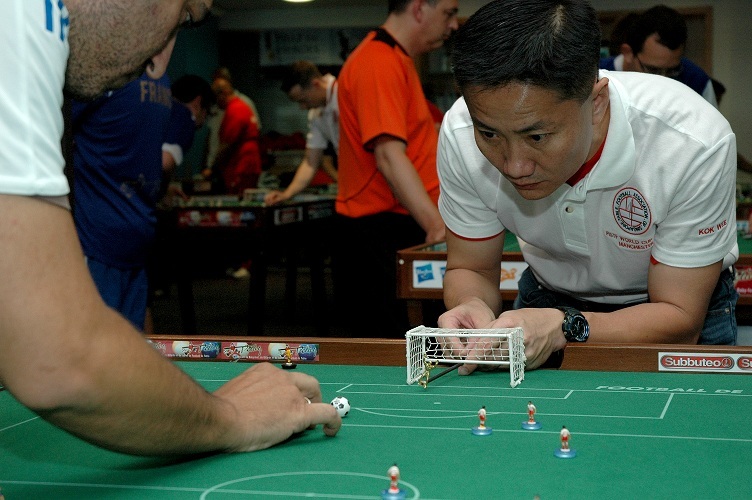 After the initial years of playing ‘local derbies’ with his brother, Bernard began to play competitively in national level tournaments organised by the then Subbuteo Association of Singapore right up to the late 1980s and early 1990s. Like many old-timers, Bernard stopped playing when the Association was dissolved; and the transition to adulthood took precedence. After a hiatus of more than 20 years, Bernard re-connected with the game again in June 2013 and has been playing since. 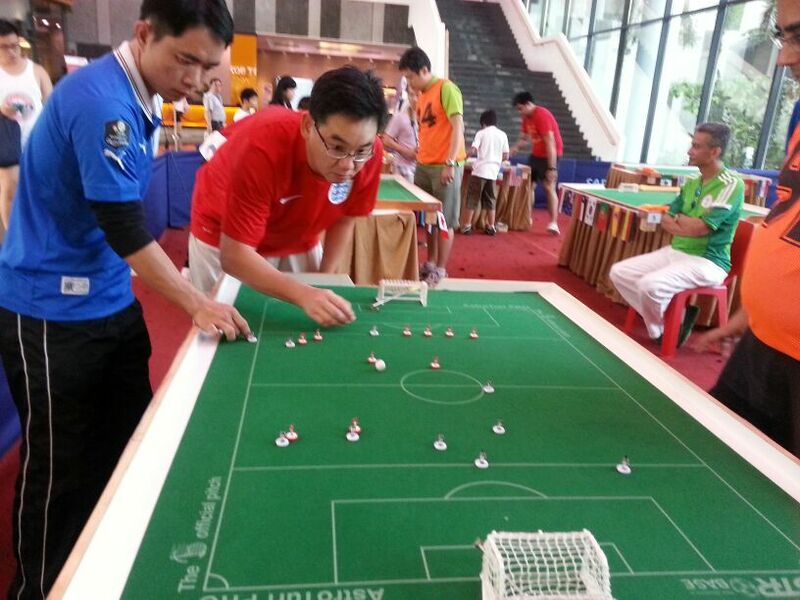 He is estactic to be able to finally fulfill his boyhood dream of representing Singapore (at the age of 42) to play in the Subbuteo World Cup!! Introduced to the game by his father in Nov 2013, Luke has only been playing the game for 9 months. His interest in the game is so immense that he first started by making his very own teams out of used bottle caps and paper figures; and using paper balls. 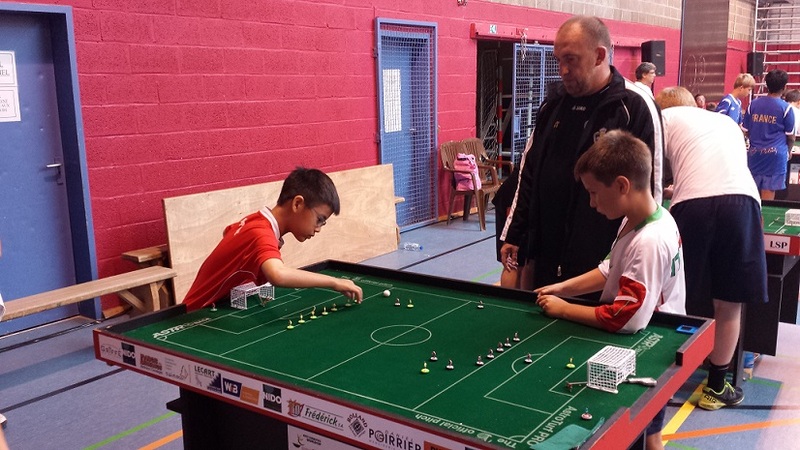 He has also written a handbook titled ‘How to Play Subbuteo: The Basic Rules’ to share with his classmates. According to Luke, he is fascinated by how a game with simple objects can lead to complex game situations and lots of excitement; and he likens this game to a combination of chess, carrom and football. 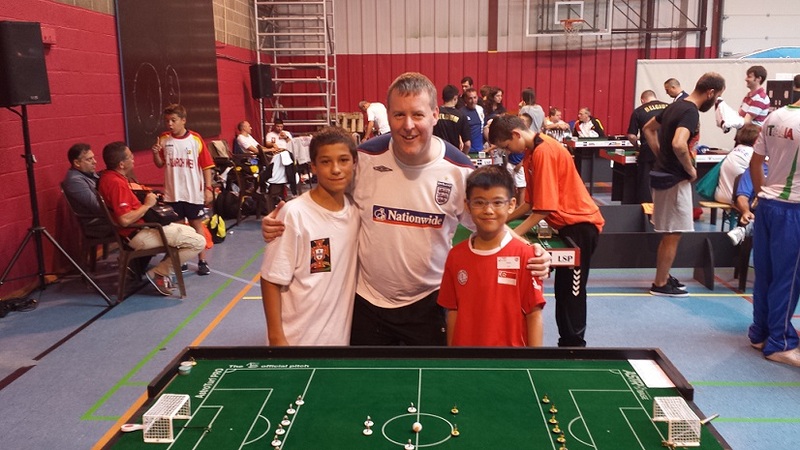 This is both his first international overseas tournament and first FISTF Subbuteo World Cup appearance. Isaac, like his older brother Luke, was introduced to the game by his father in Nov 2013. A keen and avid footballer himself, Isaac sees many similarities in both games and the tactics of one can be applied to the other. 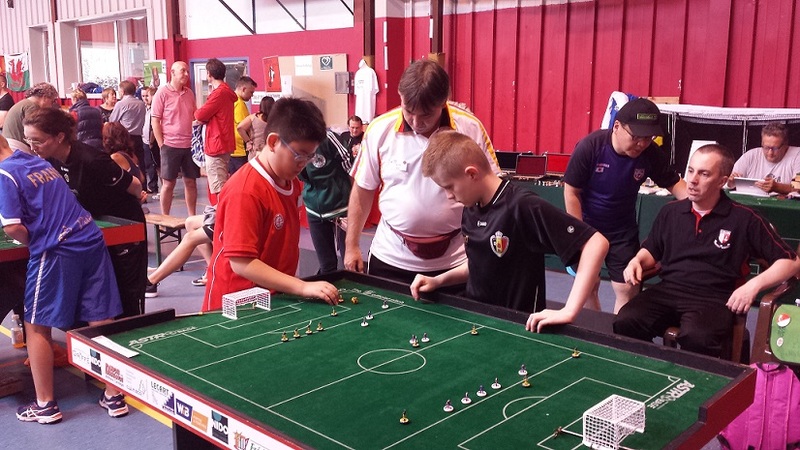 As a Subbuteo player, he has made good progress over the last 9 months. 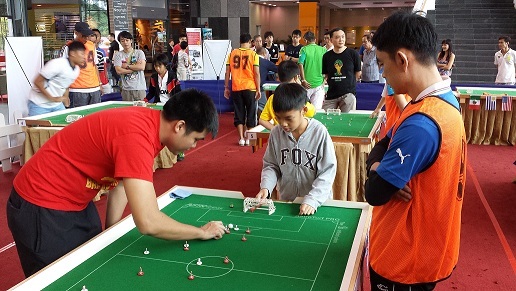 He is excited to be travelling to Rochefort, Belgium in Europe; and to represent his country Singapore in the FISTF Subbuteo World Cup. 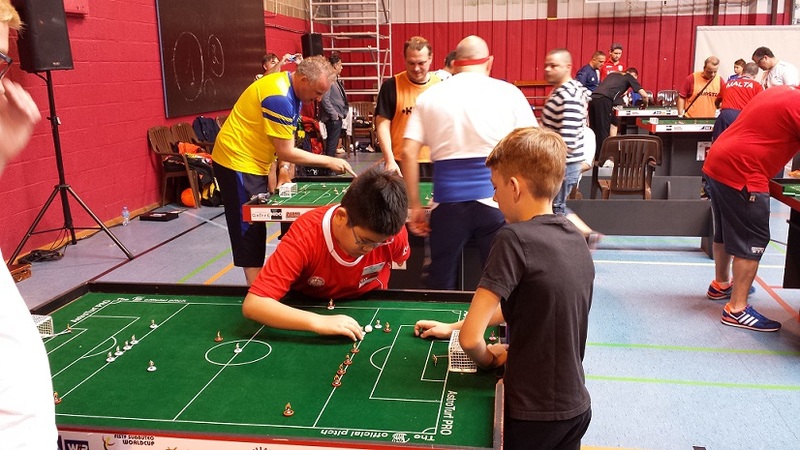 Like his brother, this is also both his first international overseas tournament and first FISTF Subbuteo World Cup appearance.